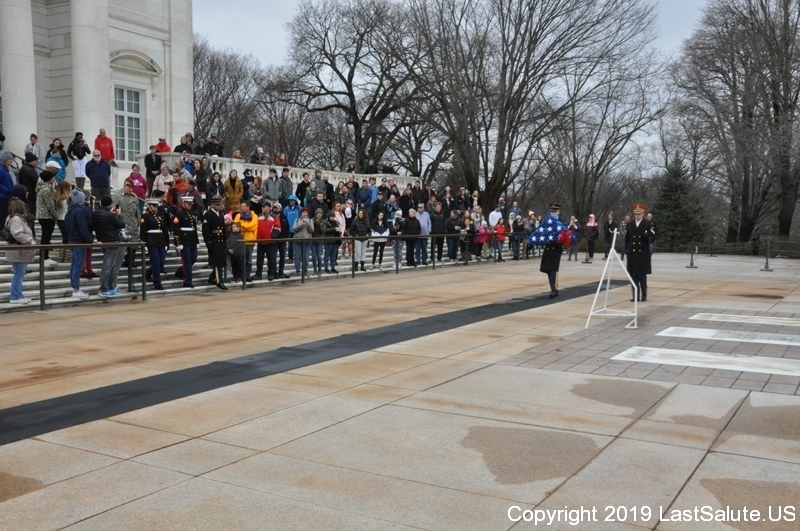 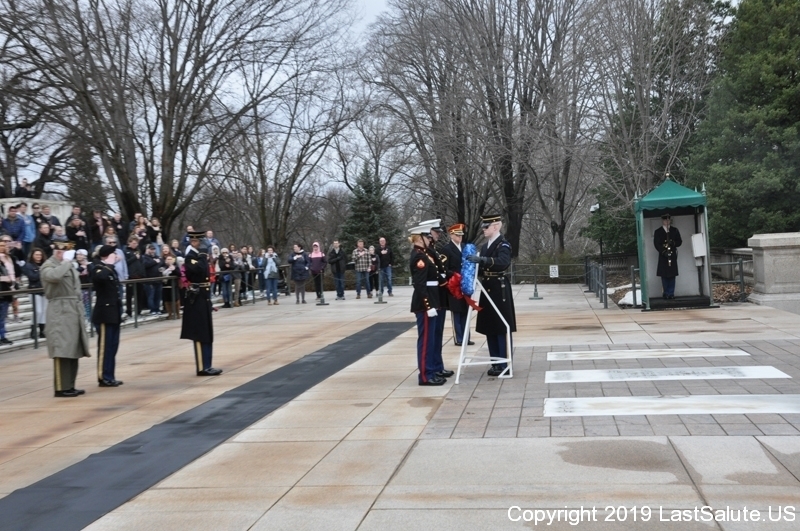 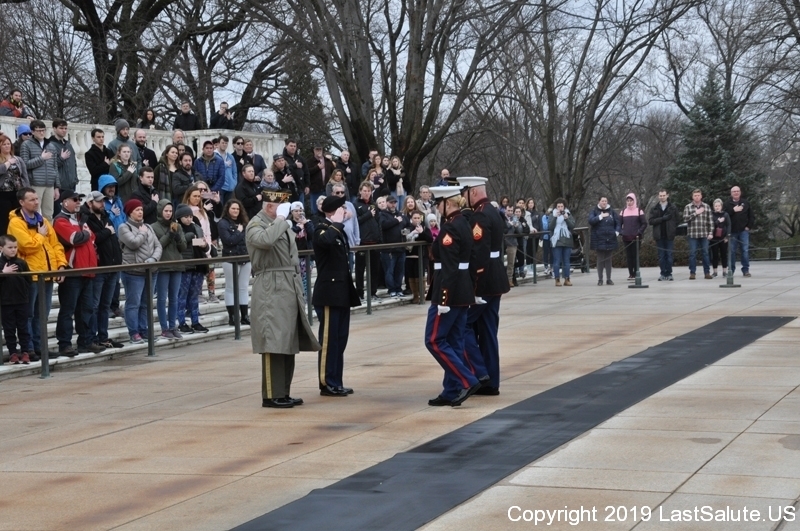 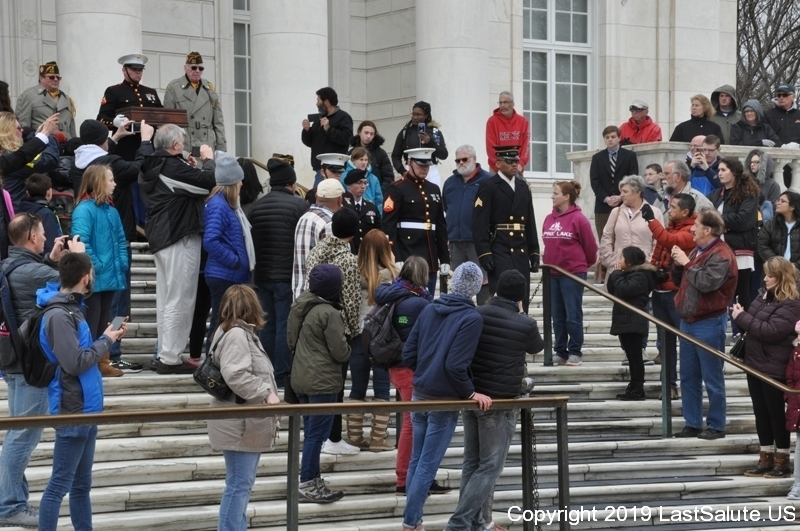 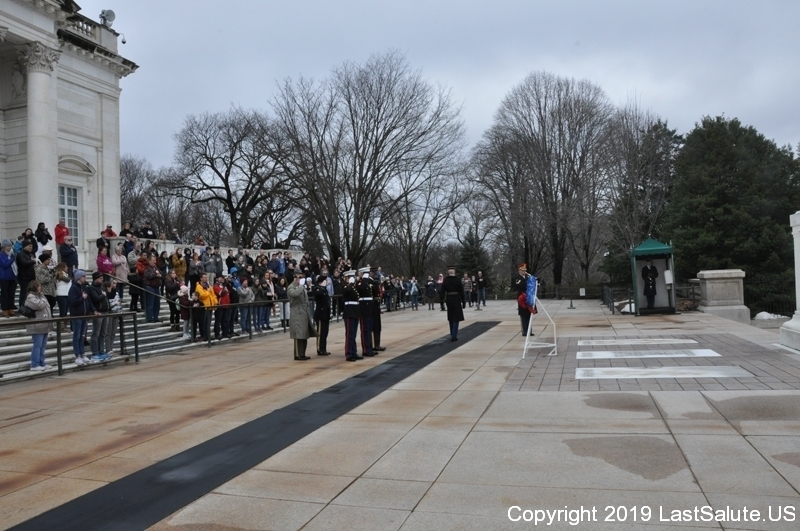 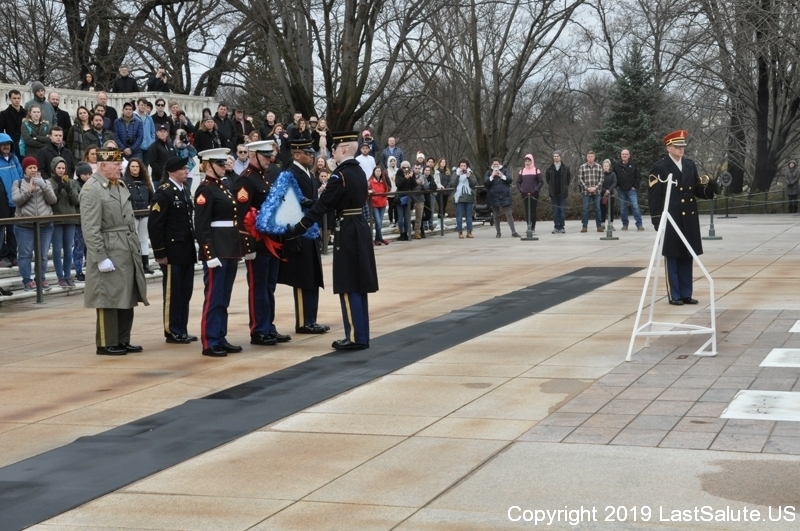 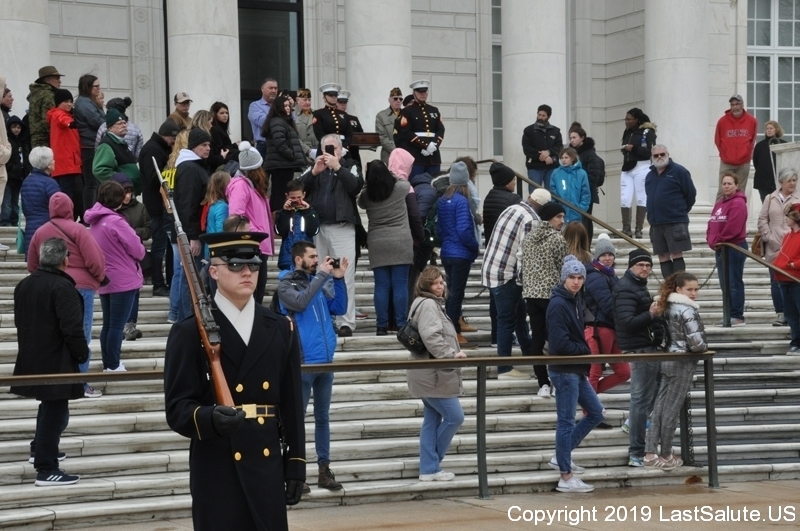 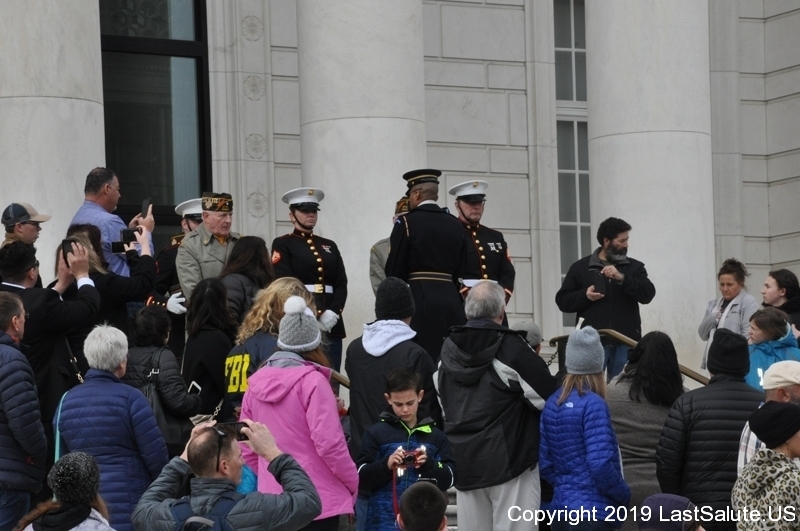 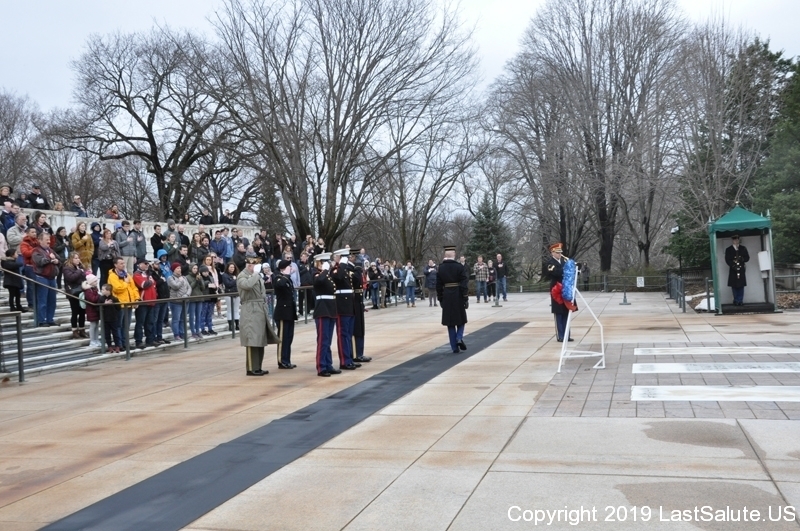 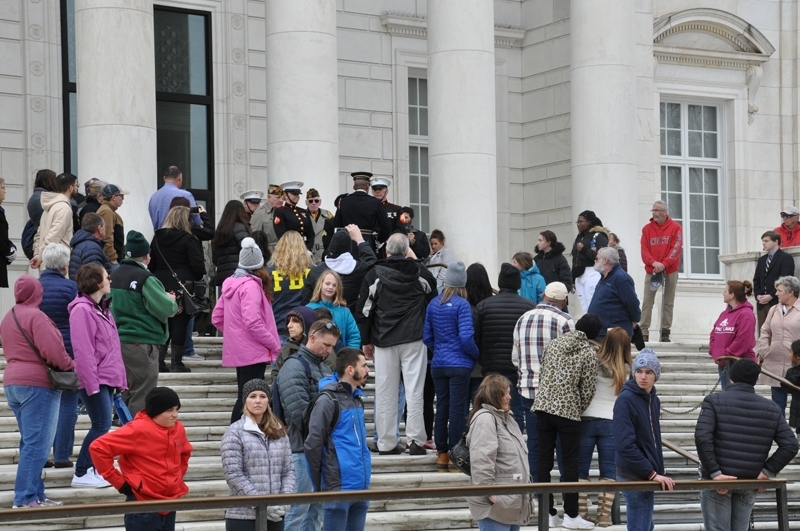 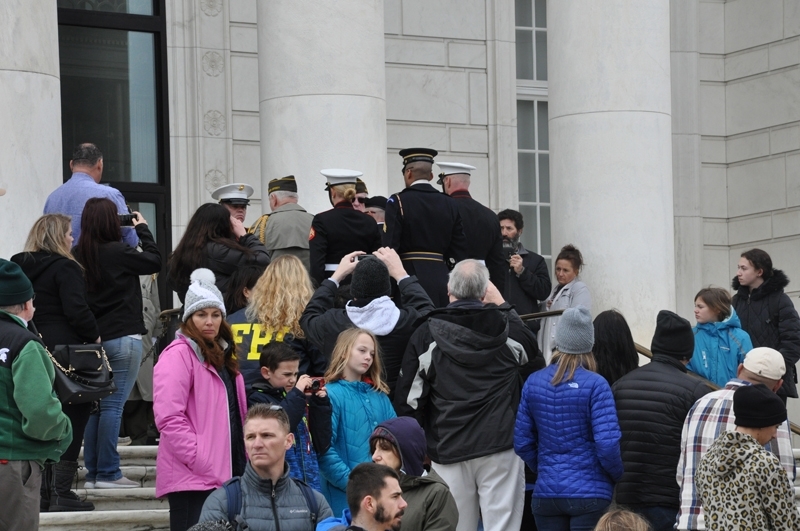 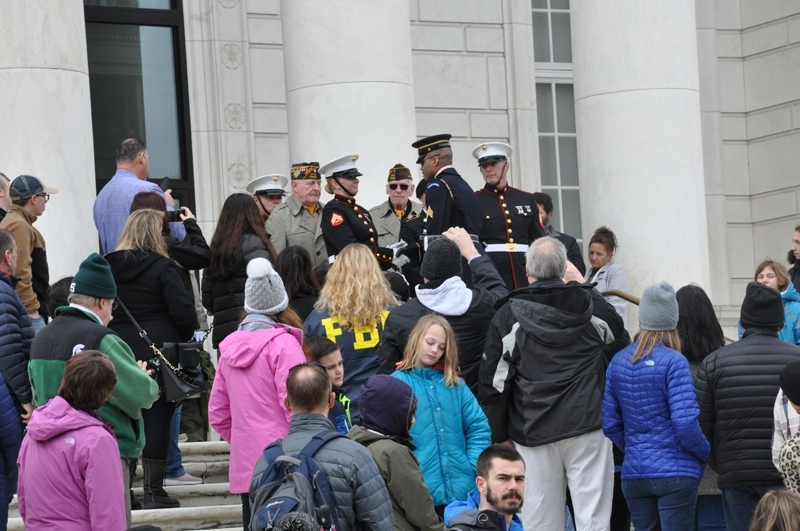 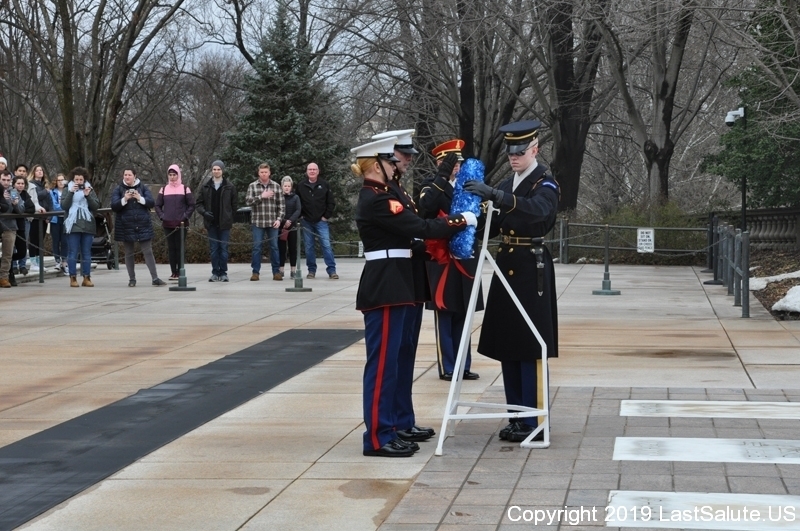 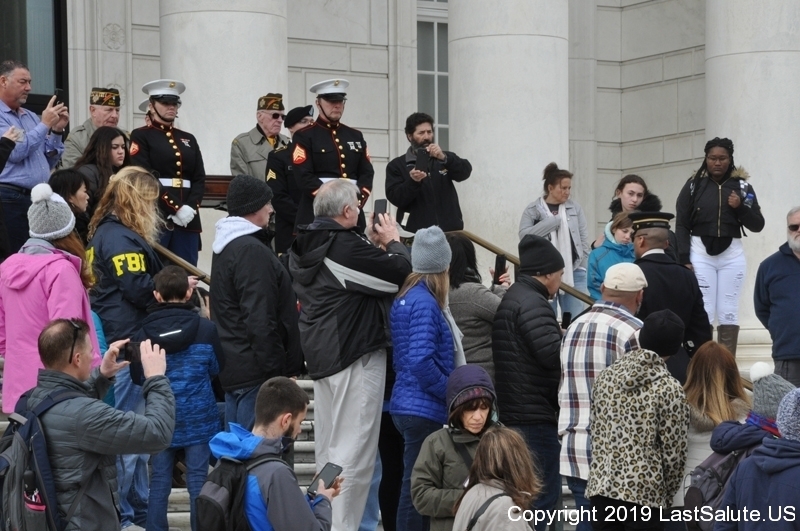 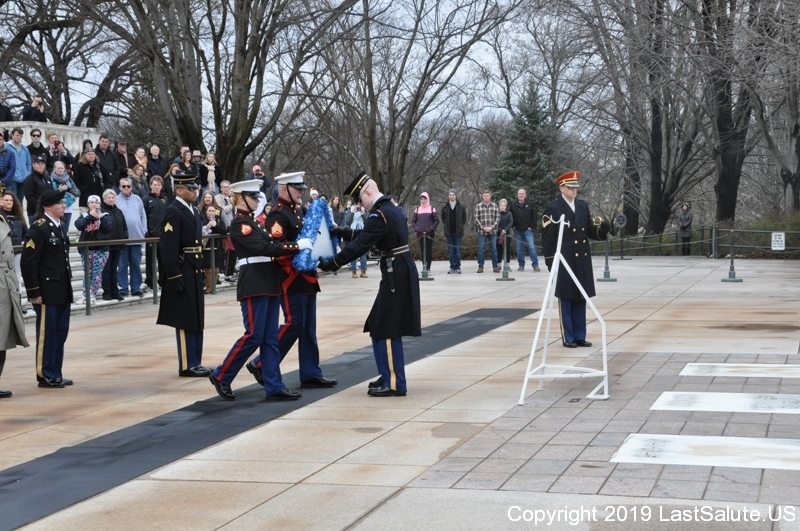 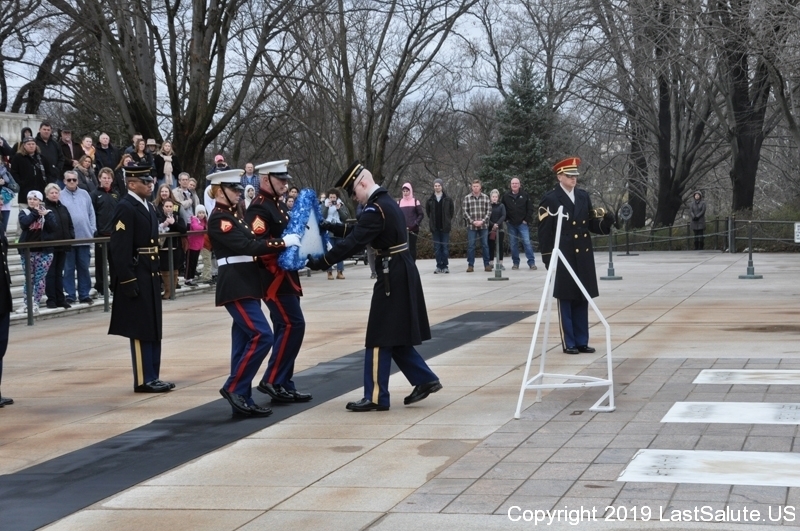 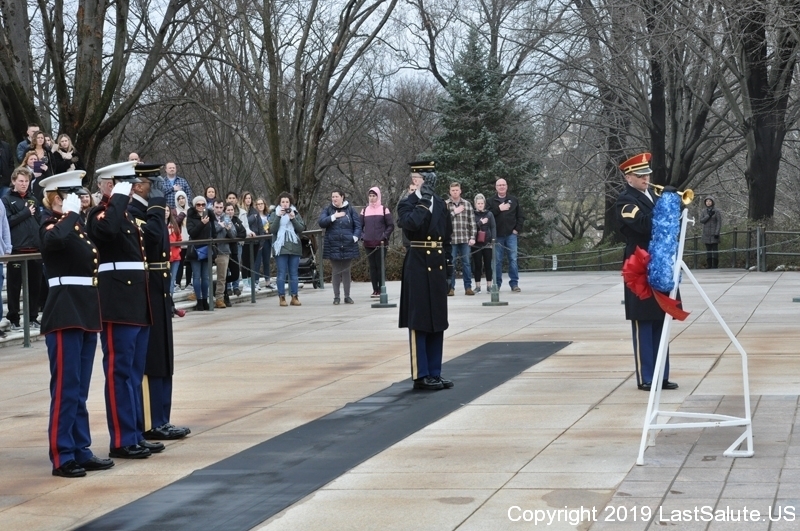 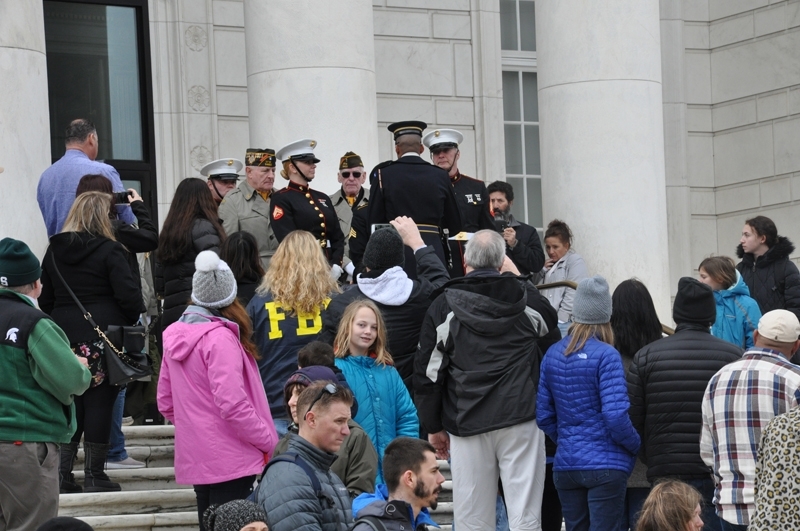 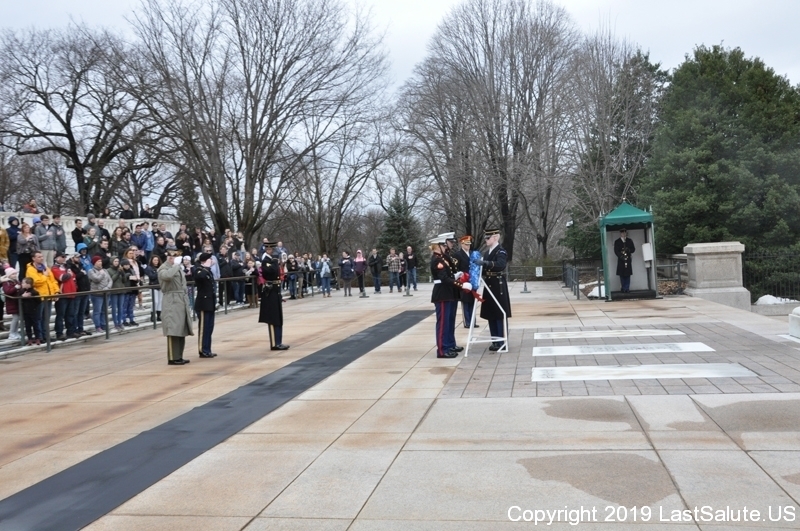 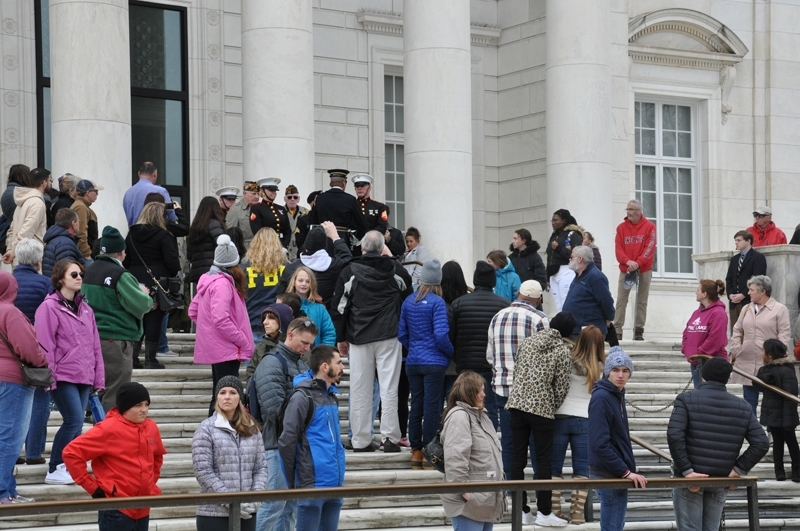 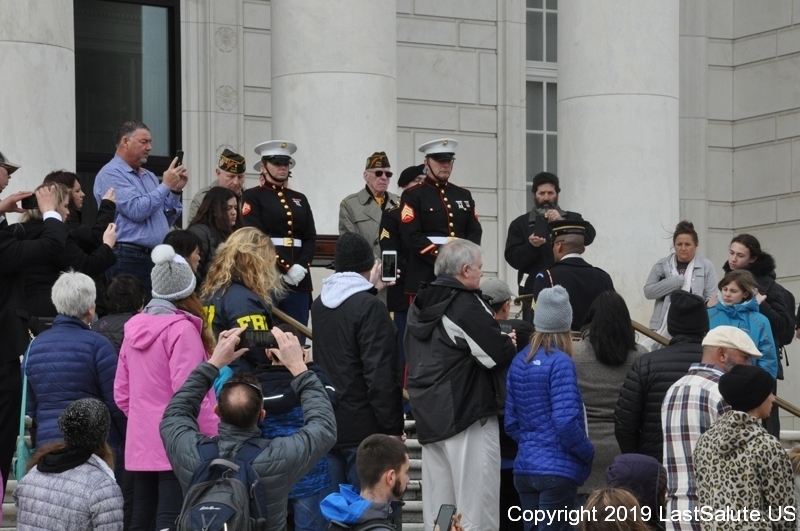 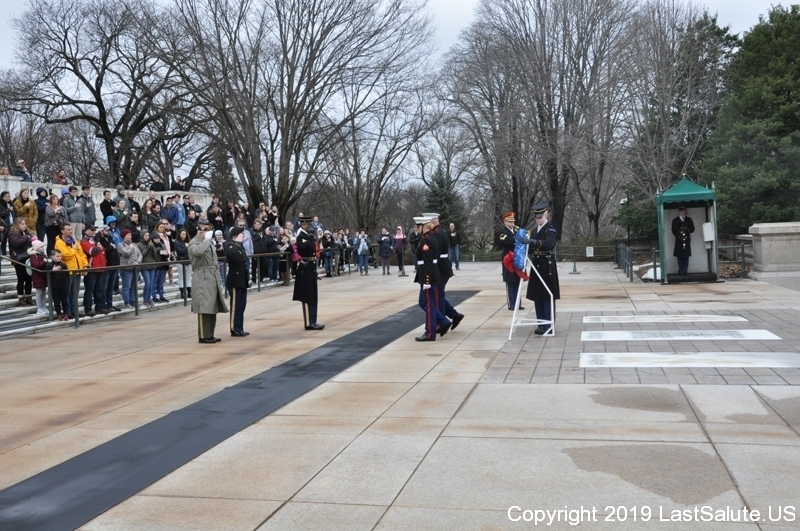 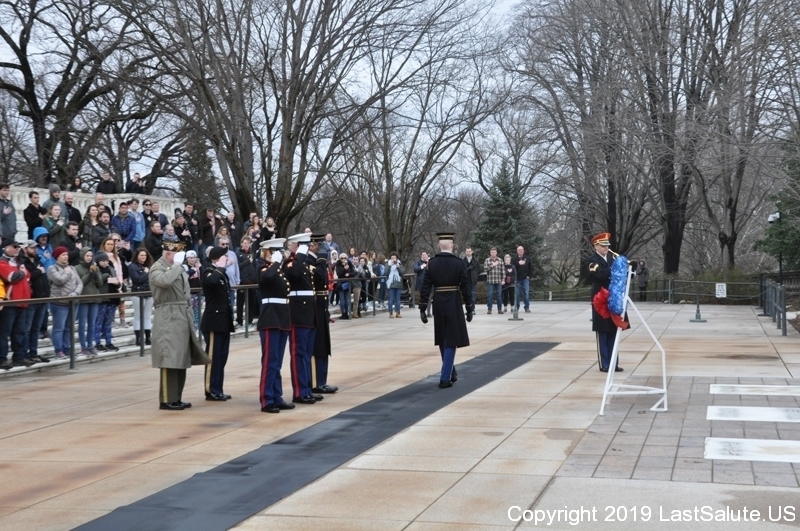 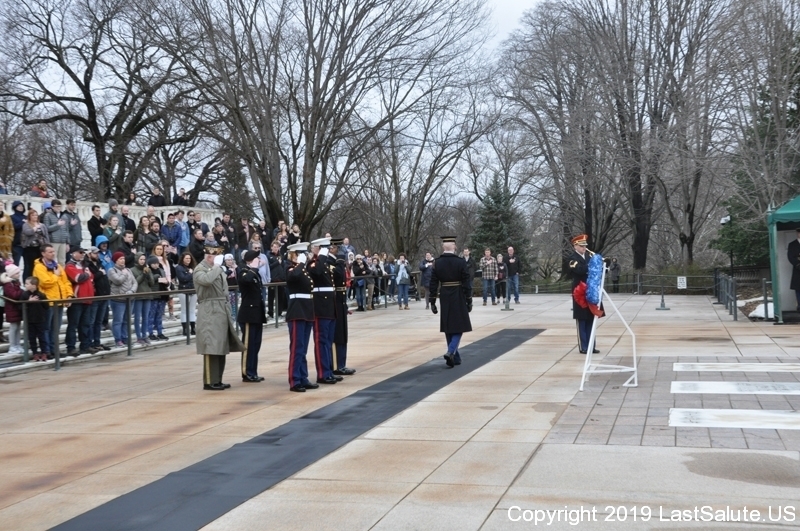 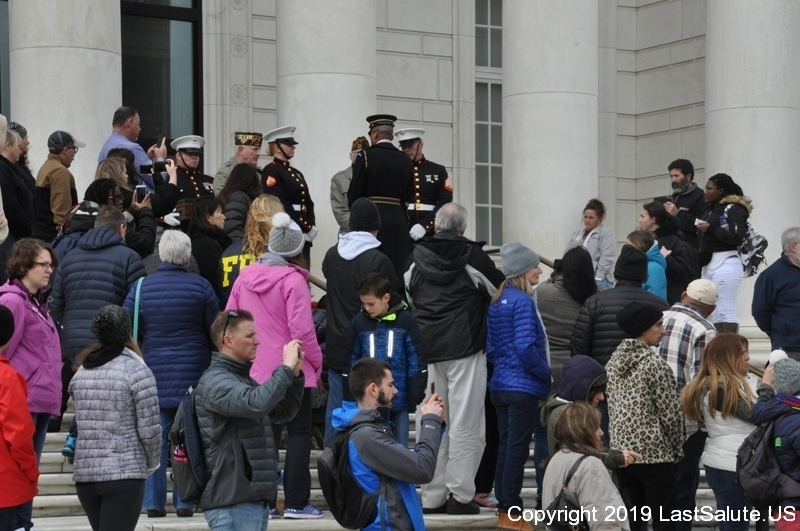 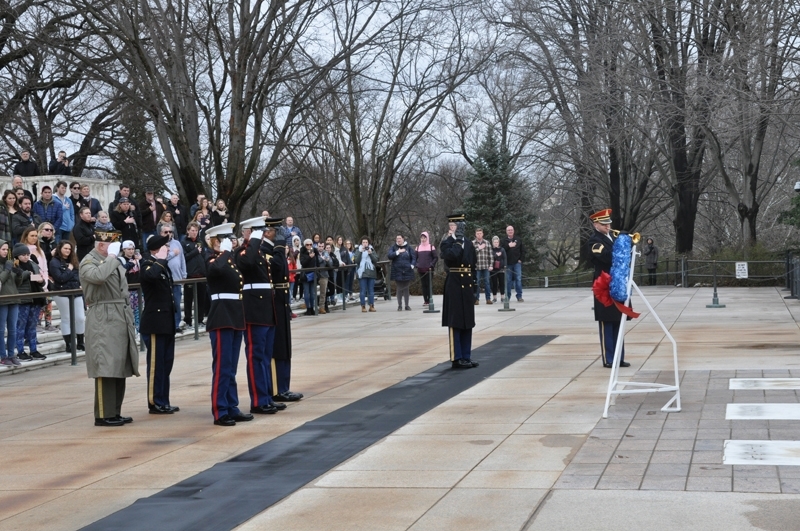 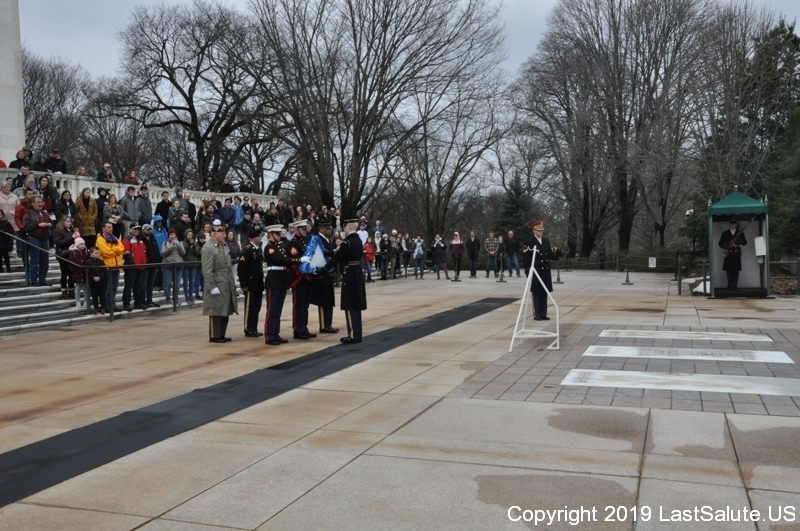 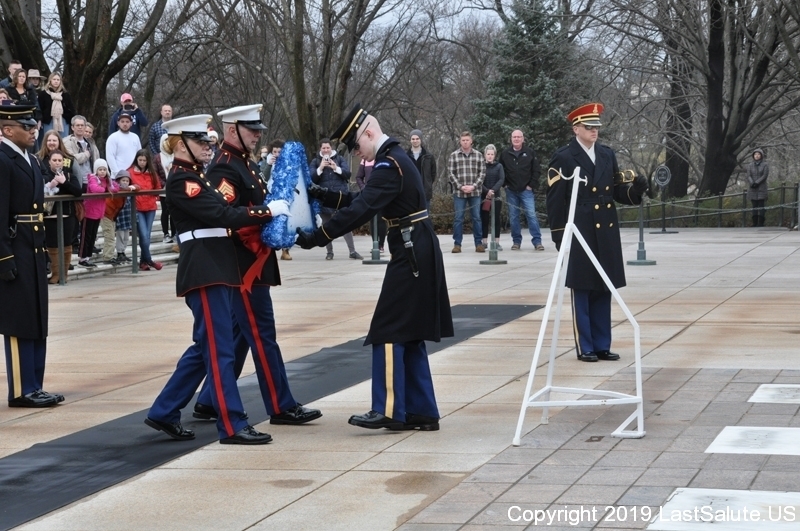 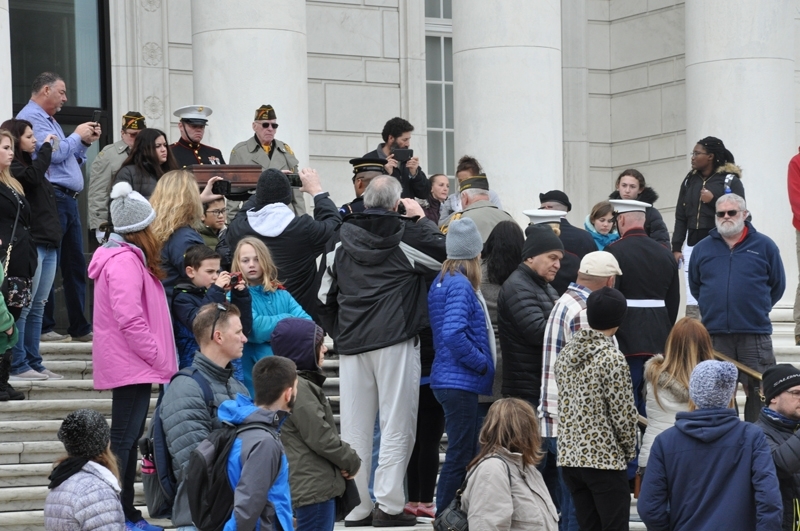 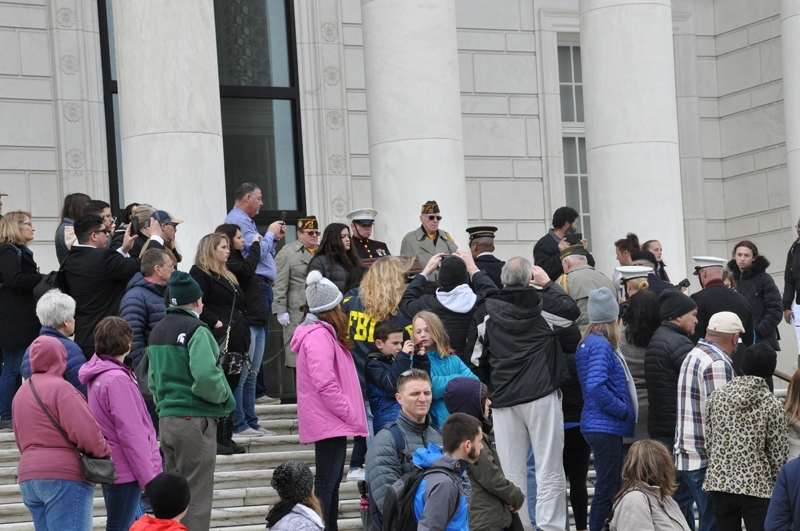 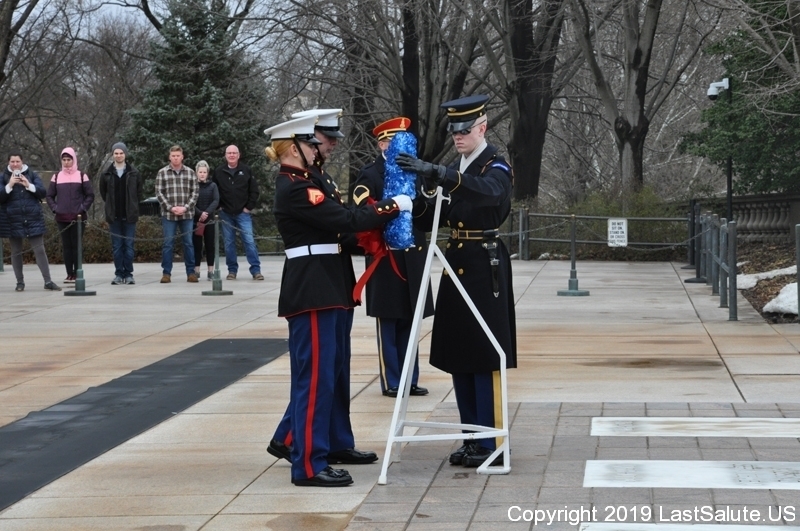 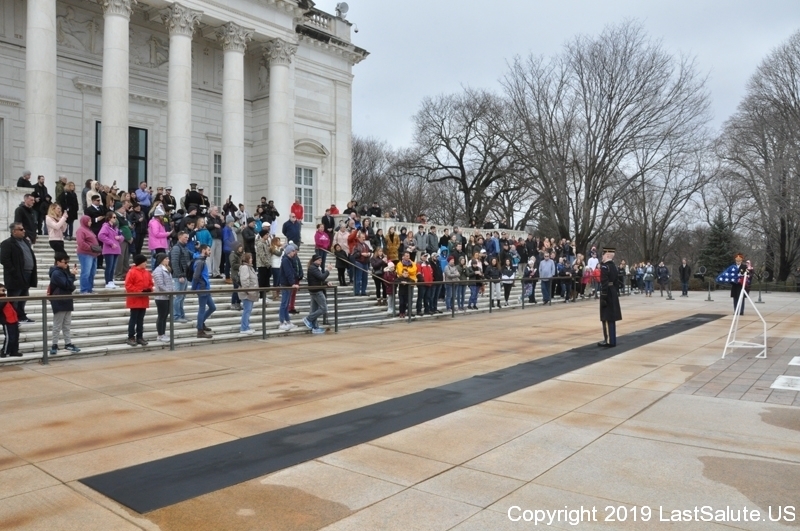 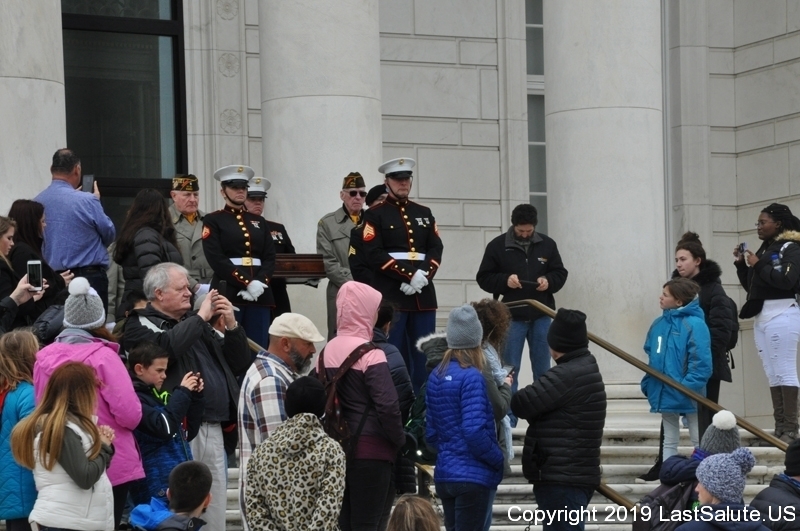 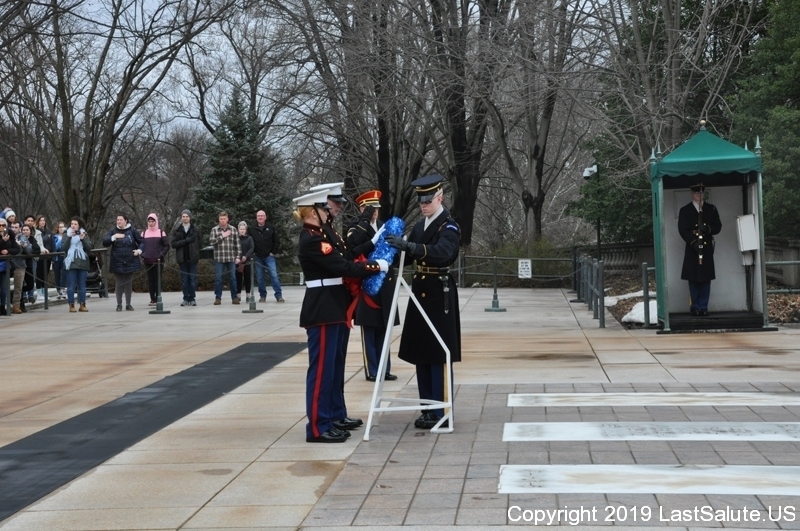 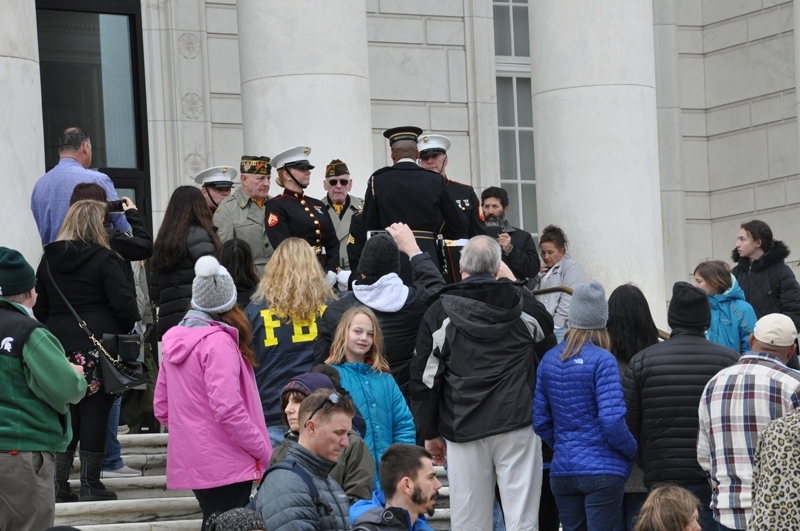 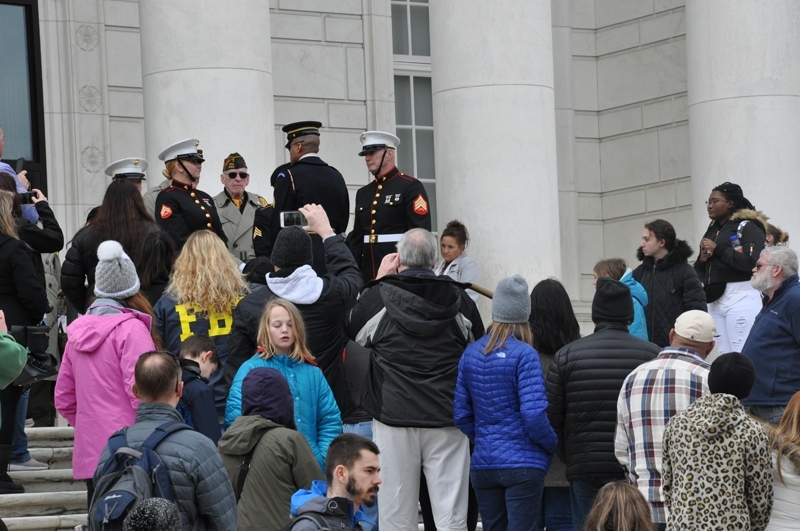 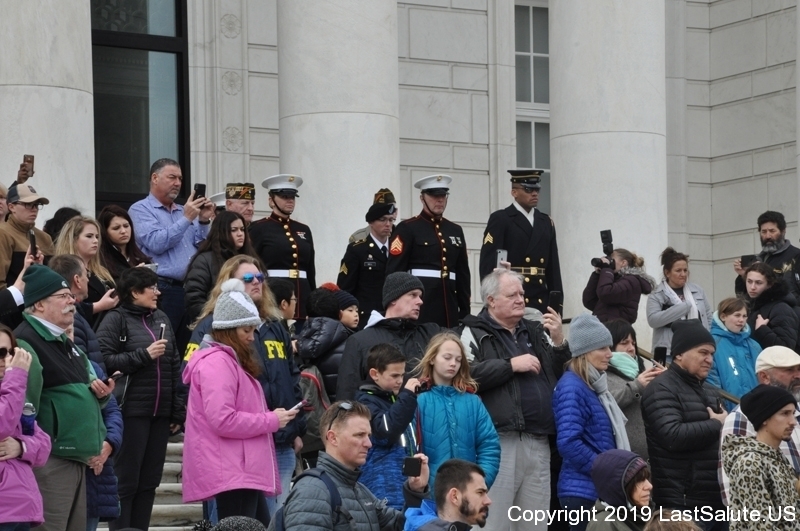 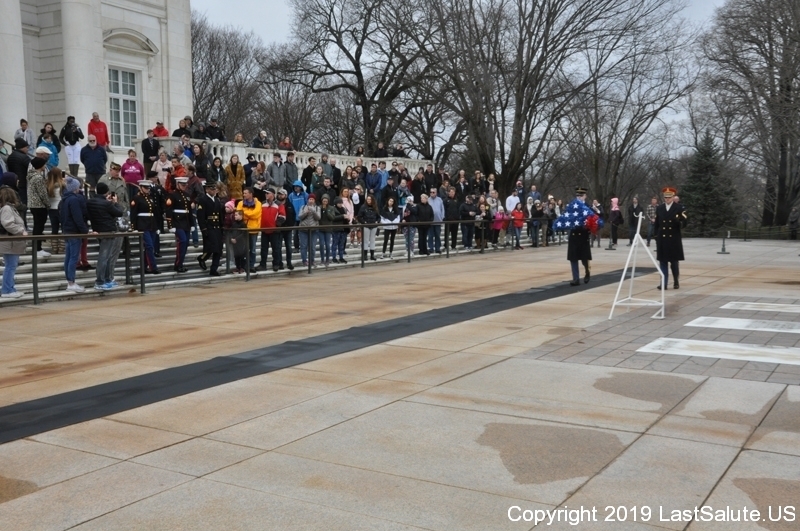 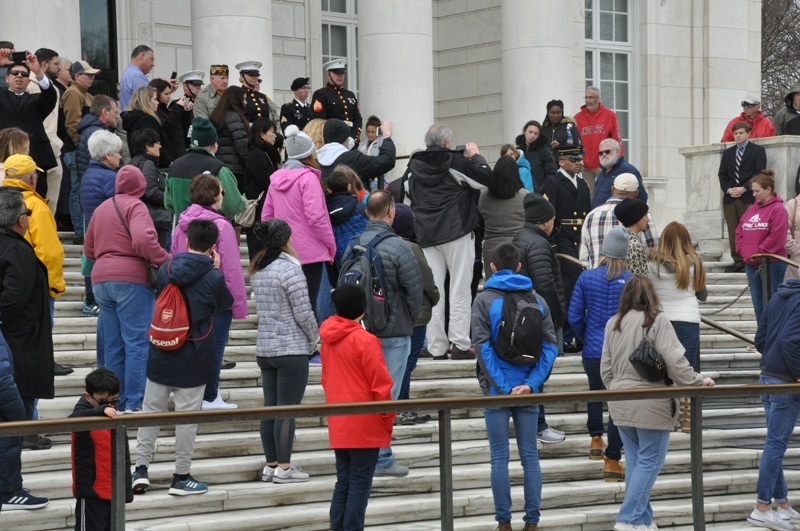 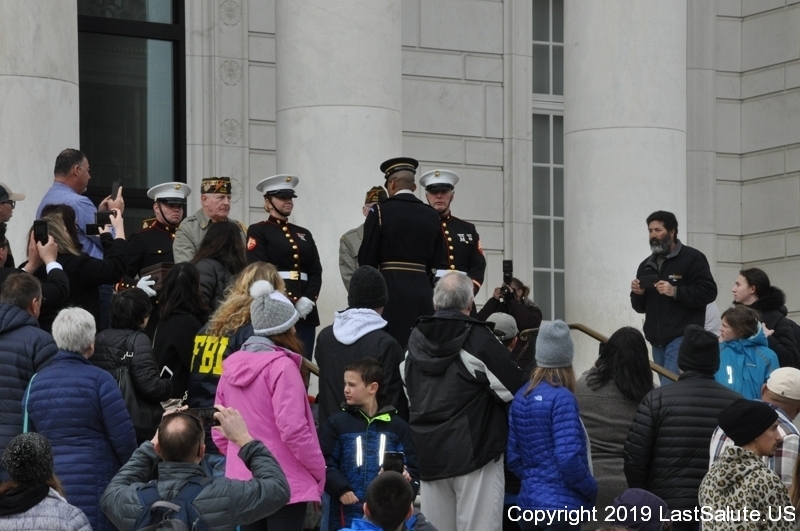 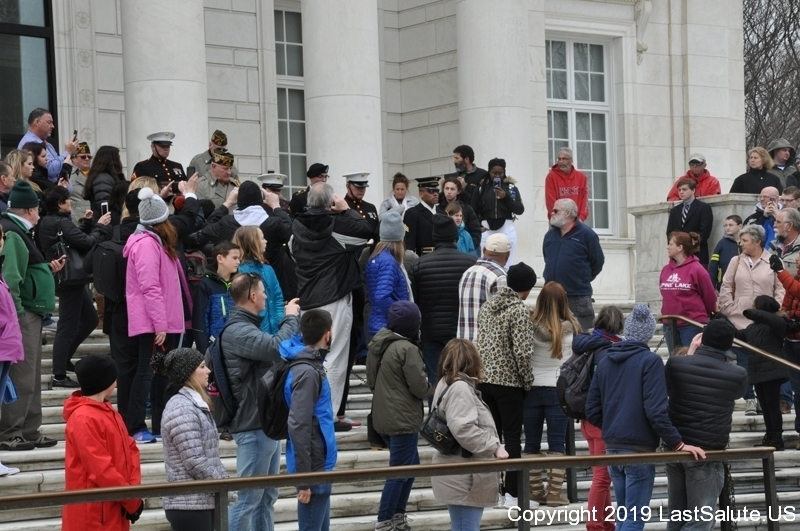 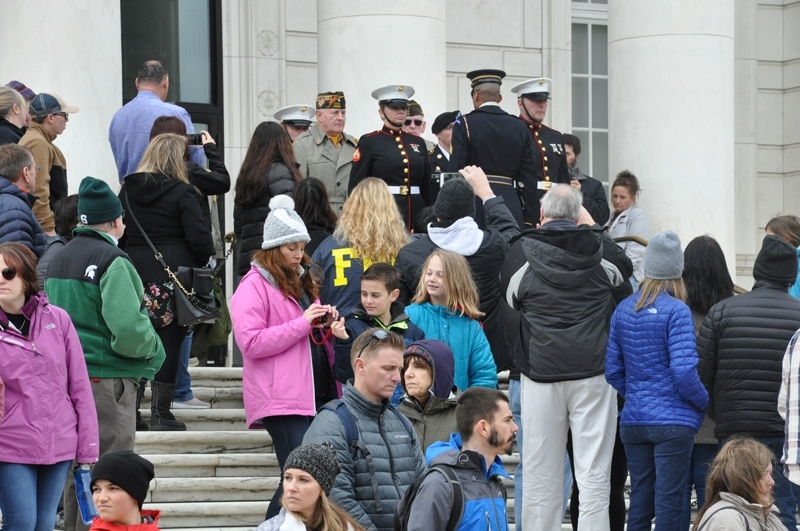 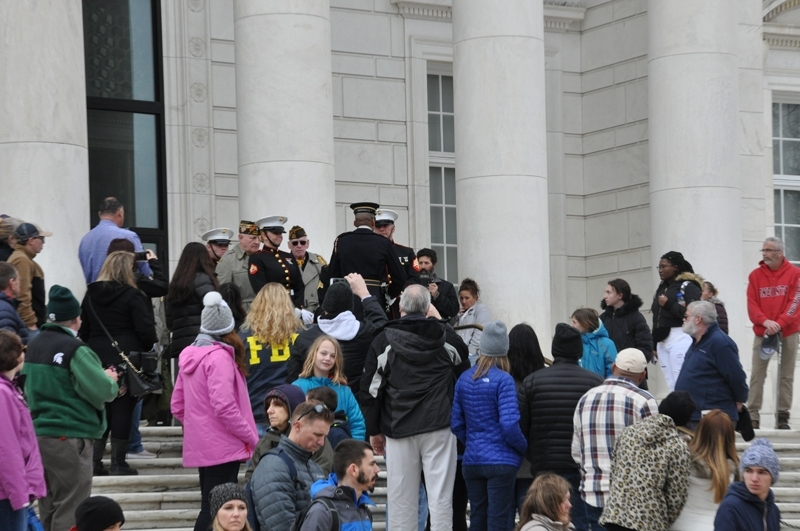 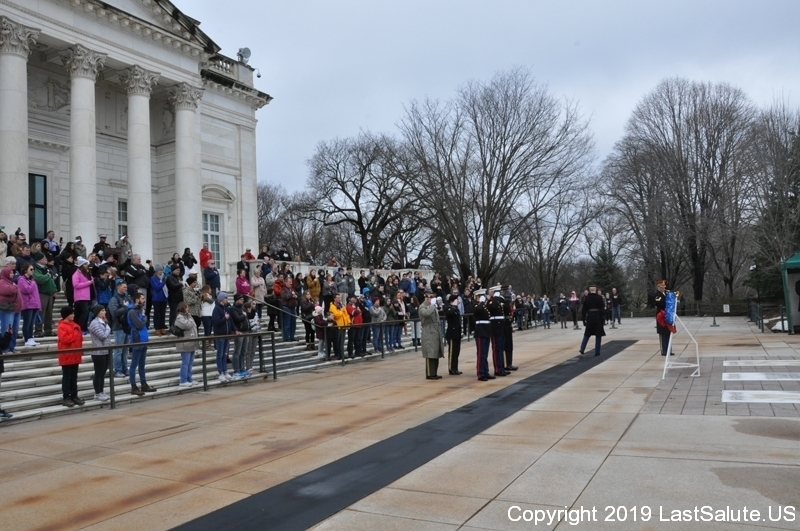 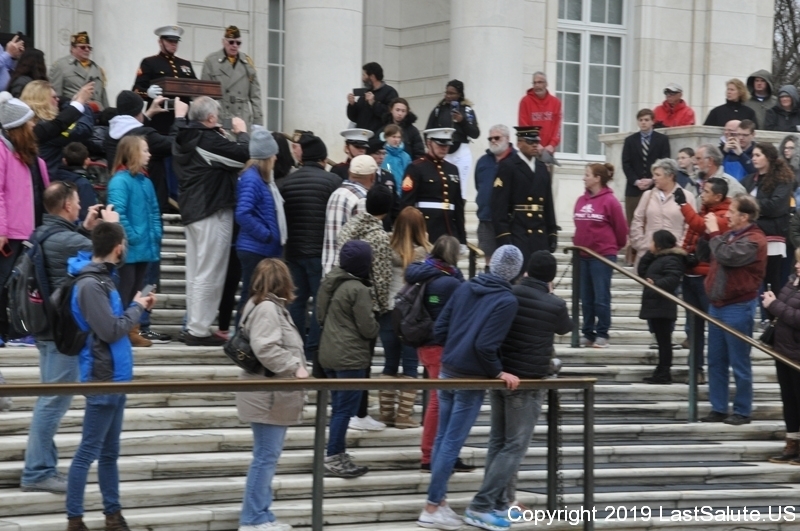 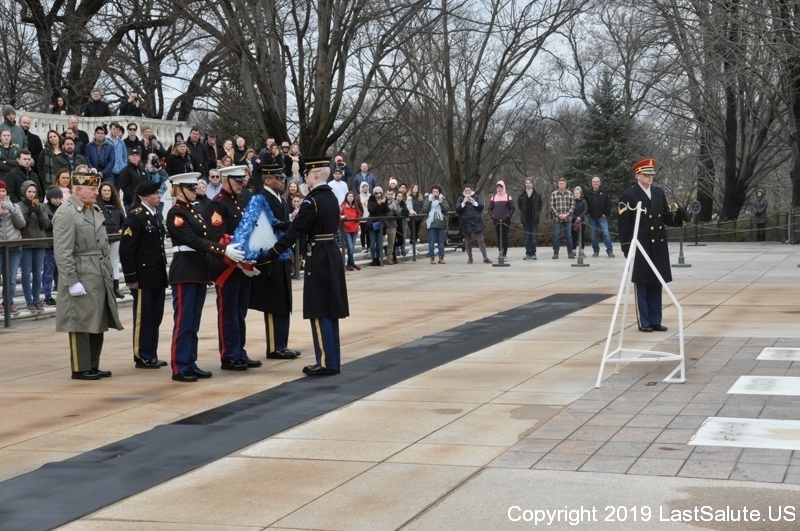 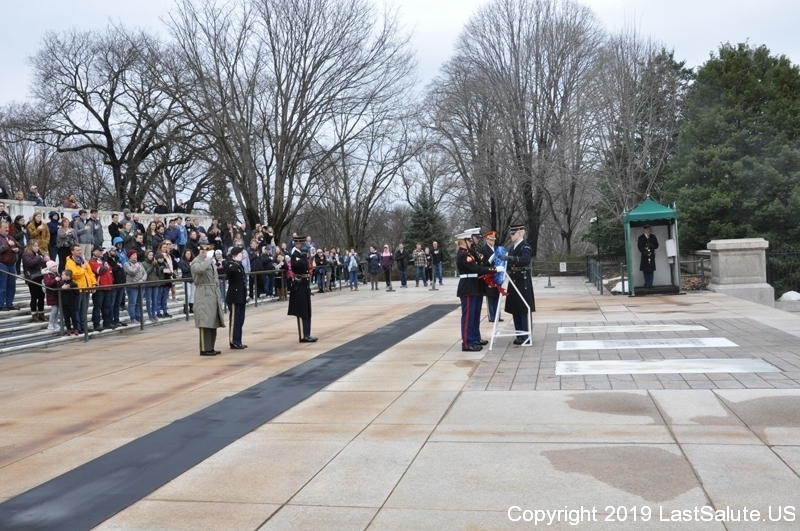 Last Salute Military Funeral Honor Guard of Atlantic County New Jersey was honored to conduct a wreath ceremony at Arlington National Cemetery on Sunday, February 24, 2019. 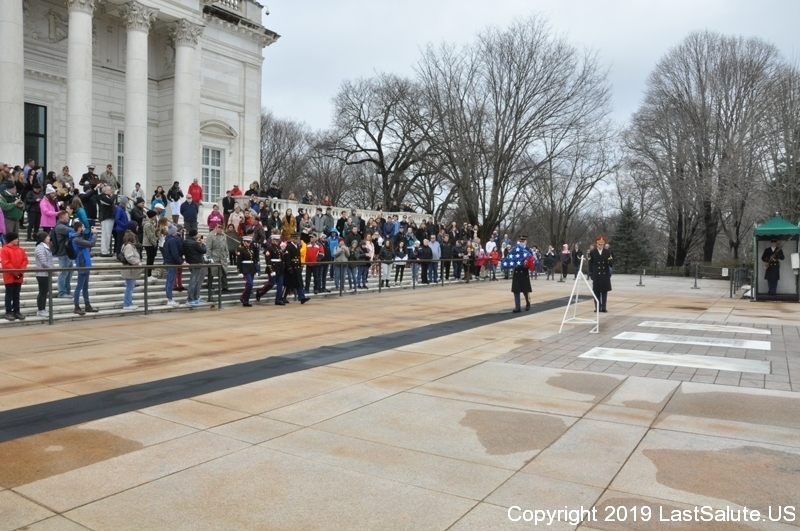 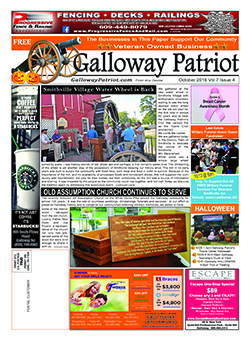 Last Salute along with the Galloway Patriot newspaper and supporters from our area made the four hour long trip to honor the heroes laid to rest at Arlington and to lay a wreath at the Tomb of The Unknown Soldier. 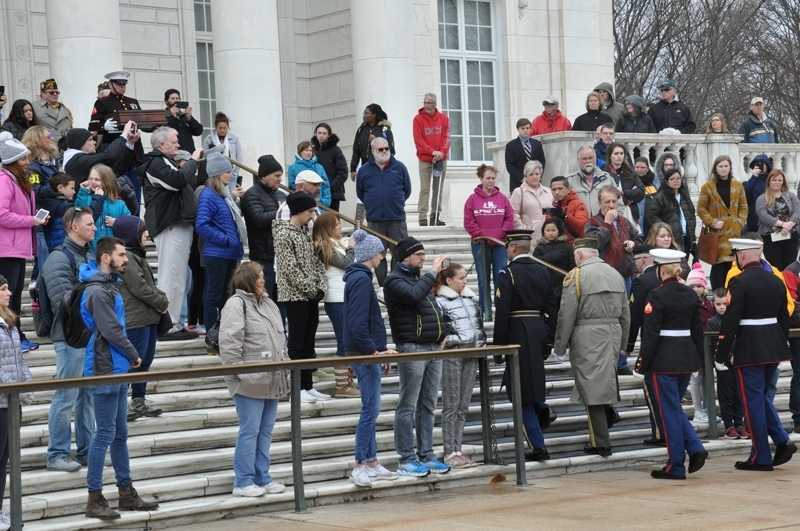 Arlington National Cemetery is our nation’s most hallowed ground. 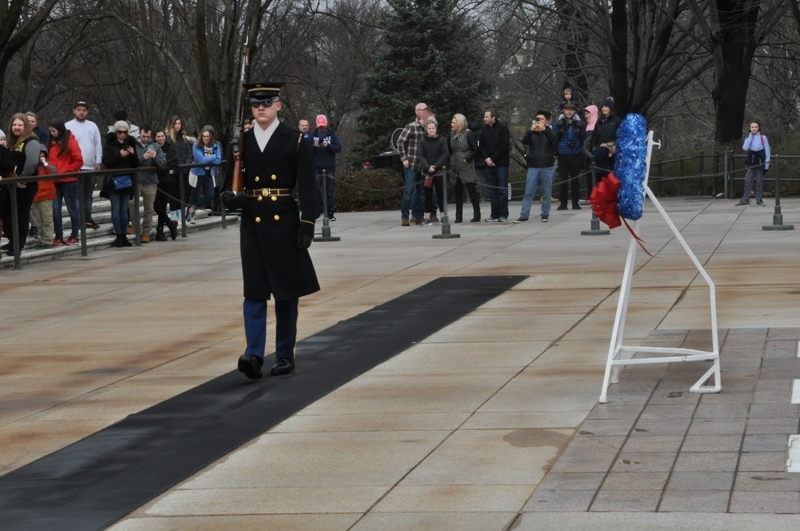 Arlington conducts between 27 and 30 funeral services each week day as well as 8 to 10 services on Saturday. 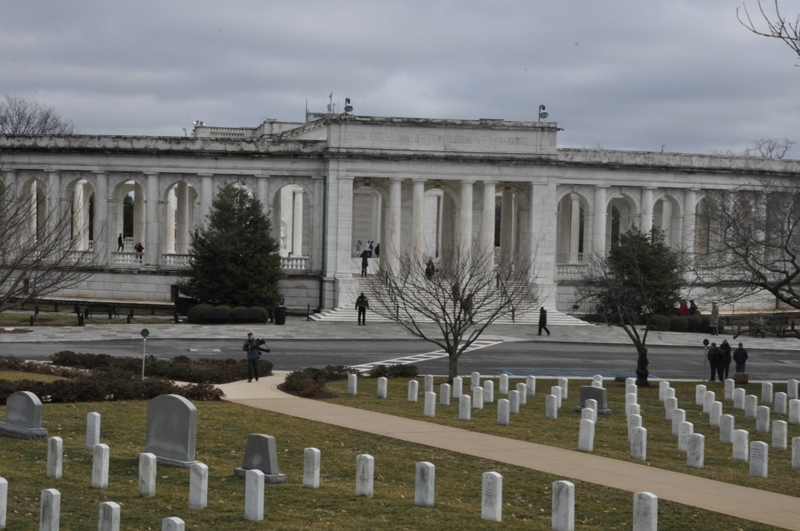 Arlington National Cemetery is 624 acres. 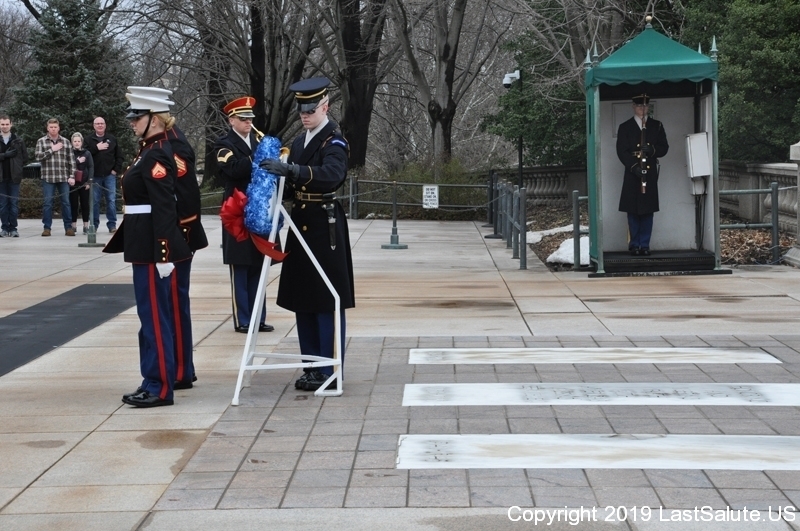 Close to four hundred Medal of Honor recipients are buried there as well as two presidents – William Howard Taft and John F. Kennedy. 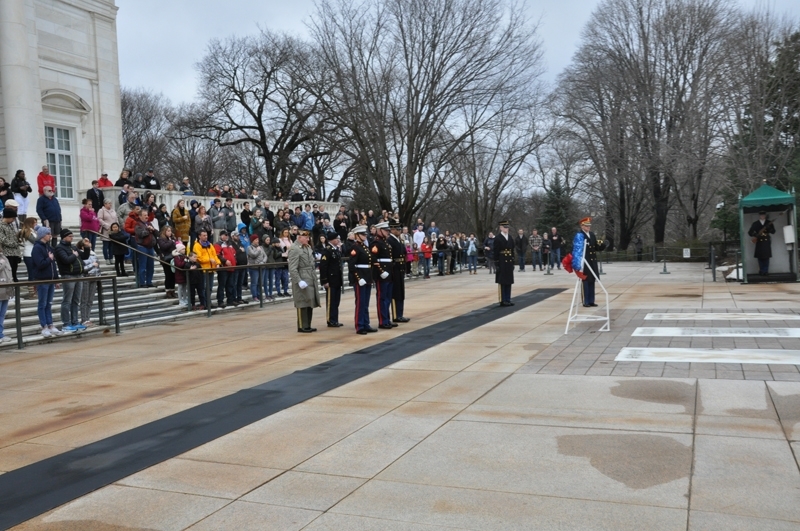 More than four hundred thousand of our greatest American’s lay inside the cemetery’s beautiful park like serenity. 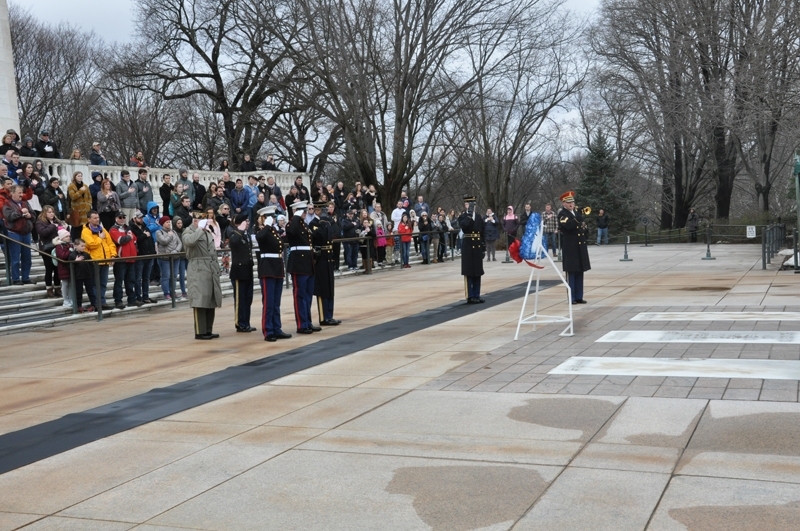 There are many amazing monuments at Arlington. 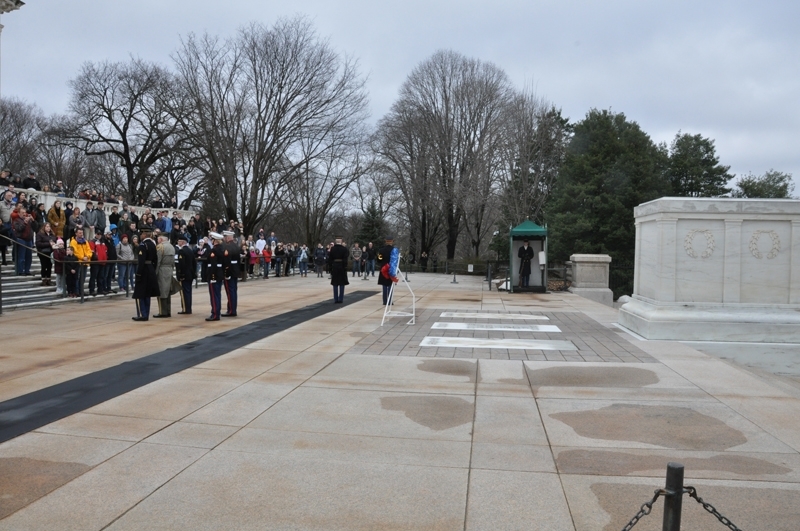 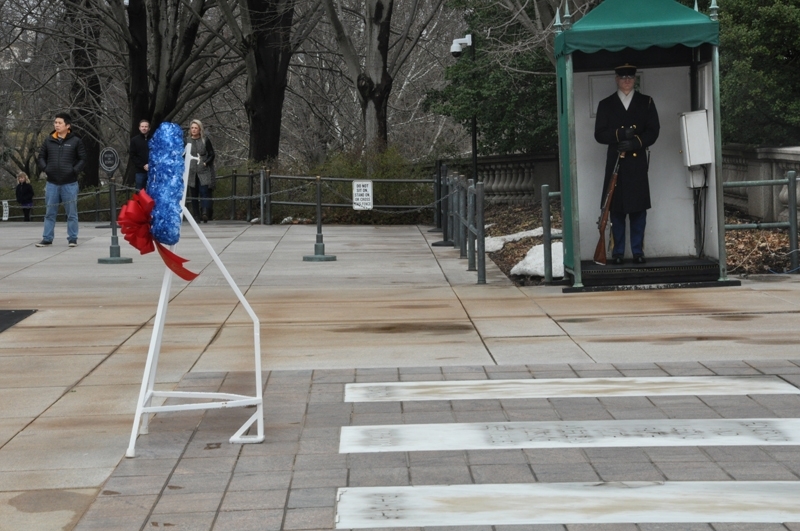 The most well-known, The Tomb of The Unknown Soldier, has been perpetually guarded since 1937 by the Army’s “Old Guard”. 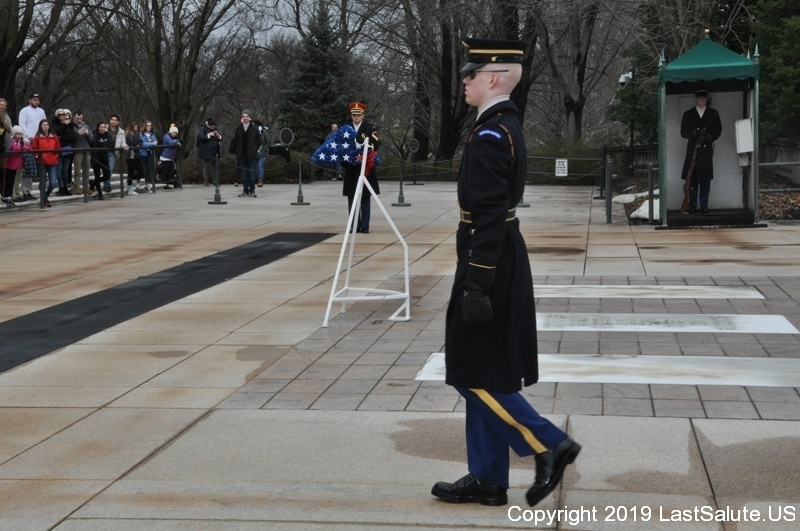 These extremely professional and dedicated soldiers provide a level of honor and dignity to our fallen that is unparalleled anywhere else in the world. 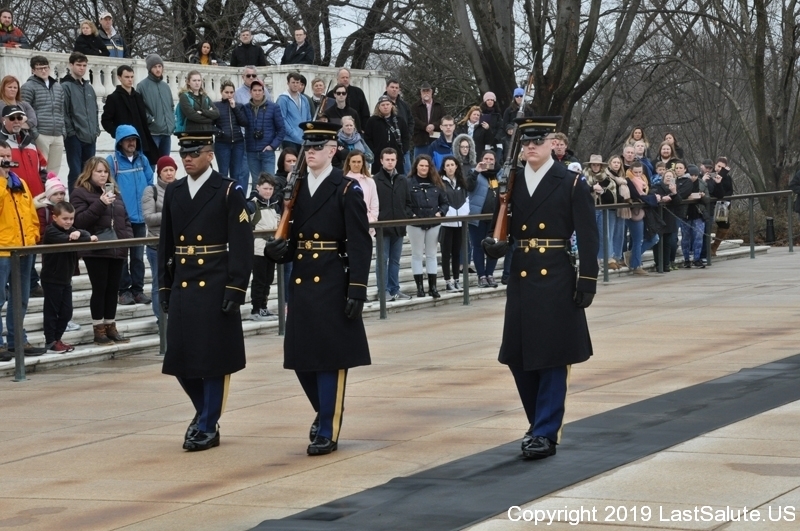 These “Tomb Guards”were extremely professional and helpful to both our photographers and Last Salute during the process of organizing and conducting the wreath ceremony. 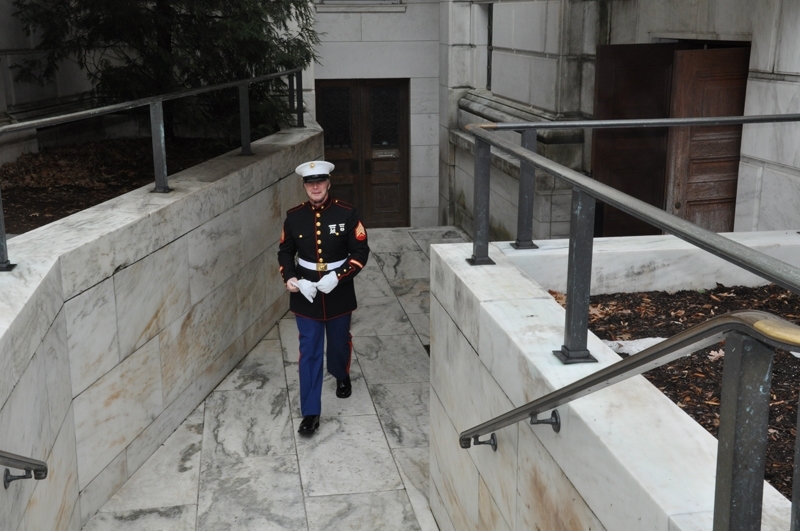 The entire staff at Arlington takes great pride in overseeing one of our nation’s most important sites. 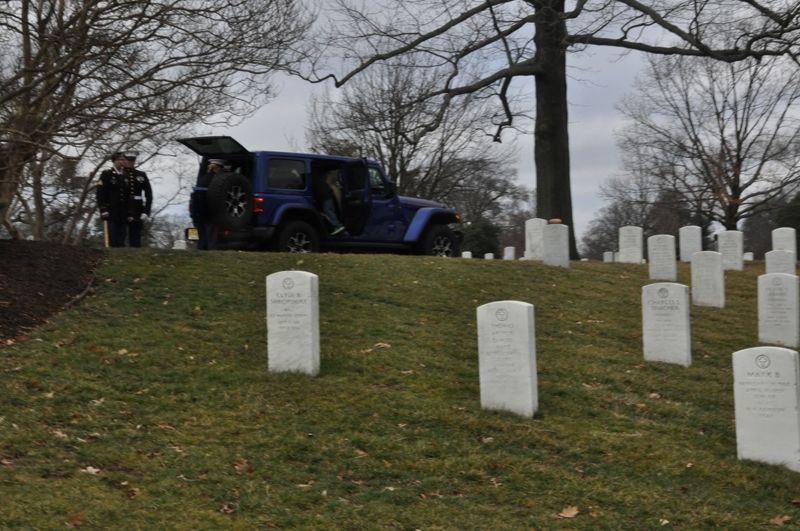 Last Salute was granted special access to the cemetery so that we could drive our vehicle though the cemetery all the way to the Tomb. 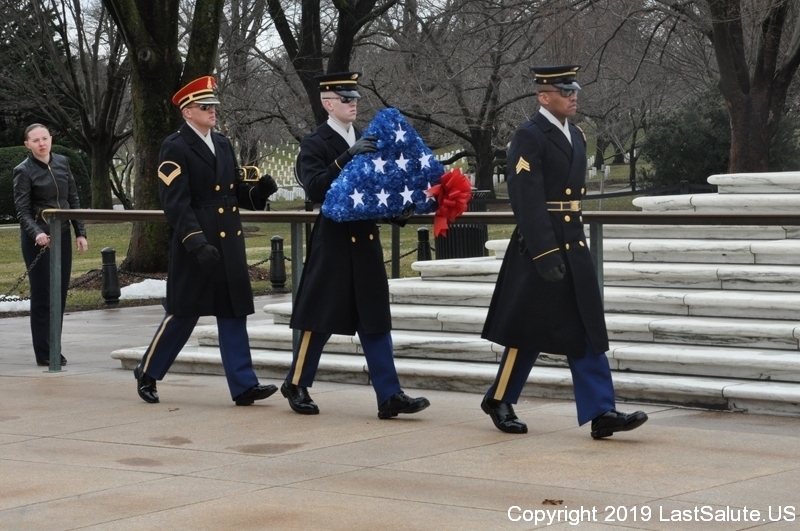 This made it much easier to transport all of our equipment, the wreath and most importantly, Last Salute’s prayer box, which contains the many prayer cards family members have placed inside. 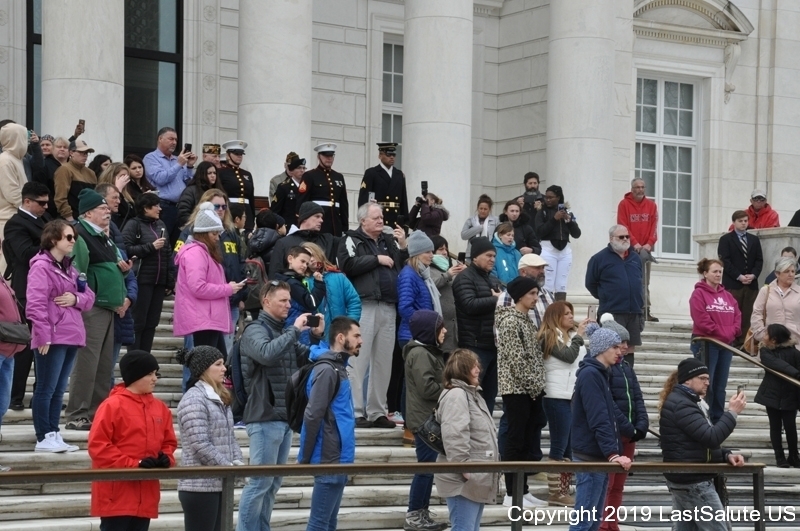 We would like to thank Arlington’s Media Chief, Kerry Meeker for her assistance. 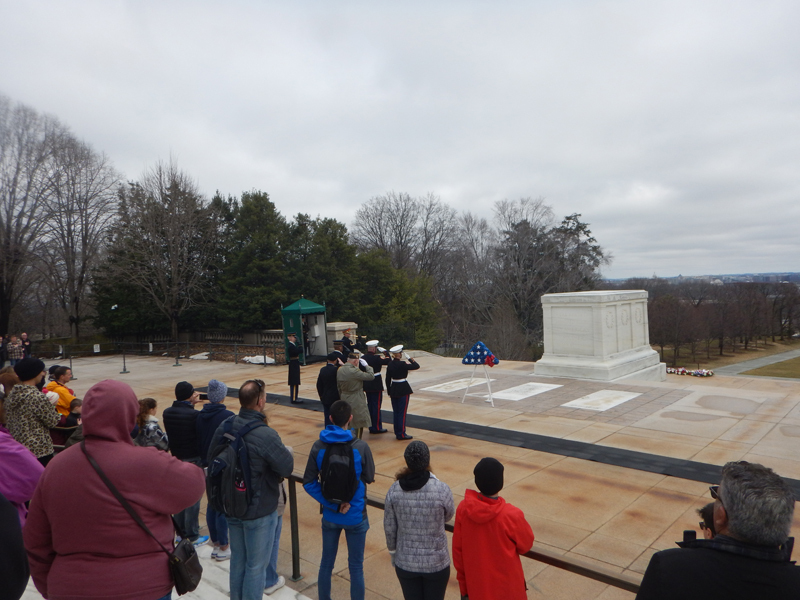 Once Last Salute arrived at the Tomb, we were briefed by a Tomb Guard at the Amphitheater. 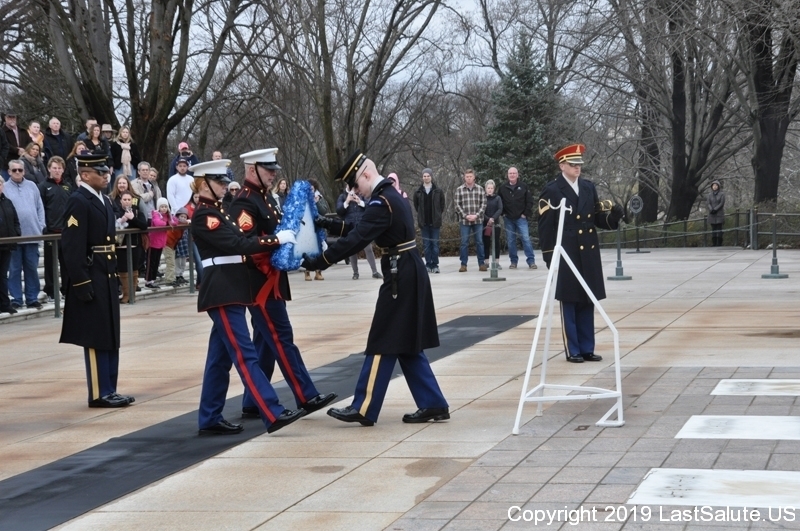 We discussed the inclusion of Last Salute’s prayer box and the ceremony’s process. 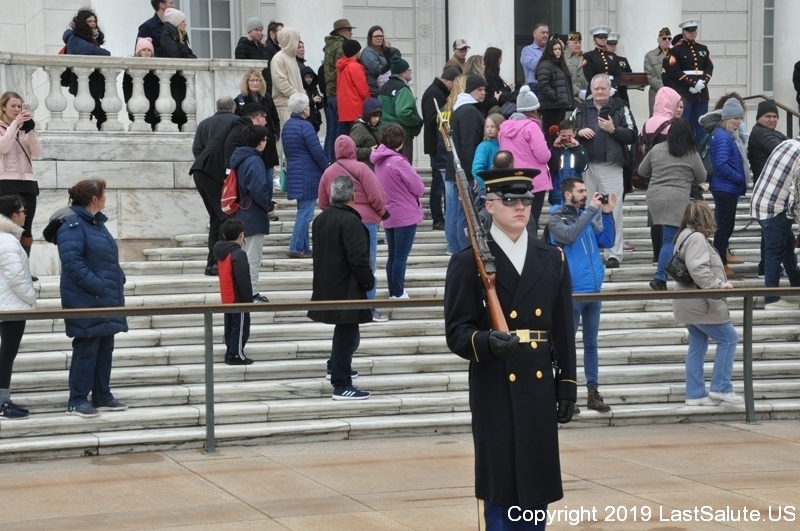 The Tomb Guard escorted our Galloway Patriot photographers to the designated “press pit” which has the best view of the Tomb and the ceremony. 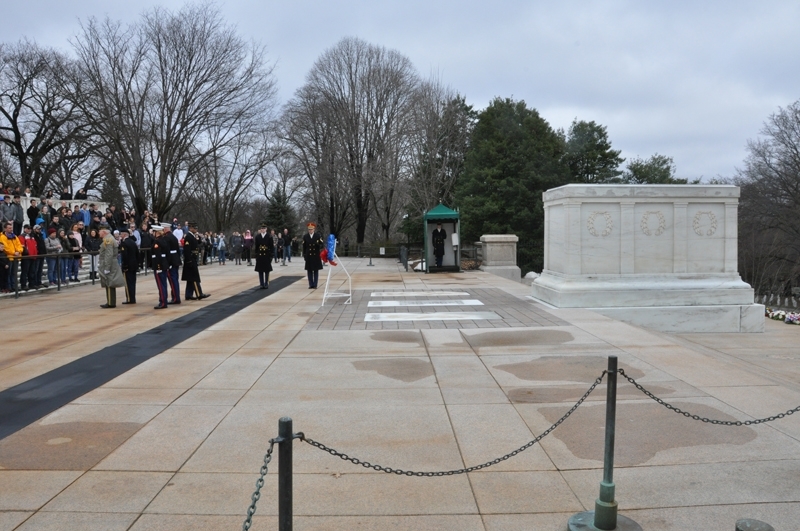 The inscription tells anyone that reads it why we must honor our nation’s heroes. 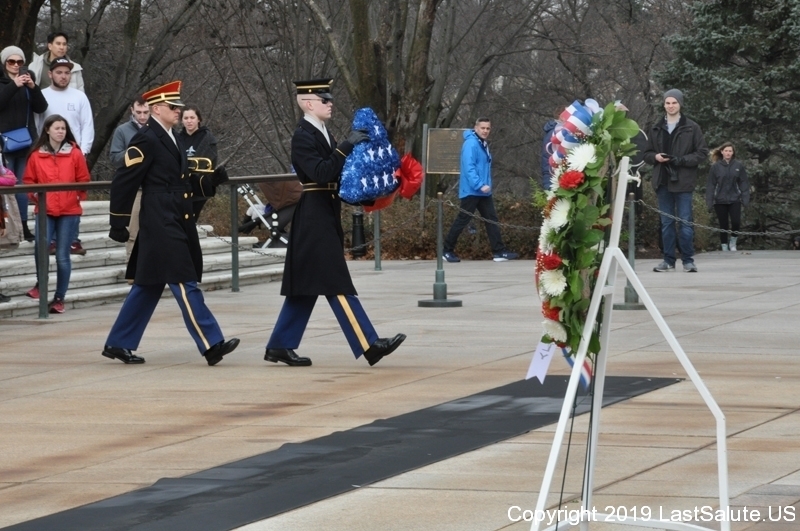 Without regard for themselves, in devoted service to our country and its citizens, there are men and women who will sacrifice all to preserve safety, security and freedom. 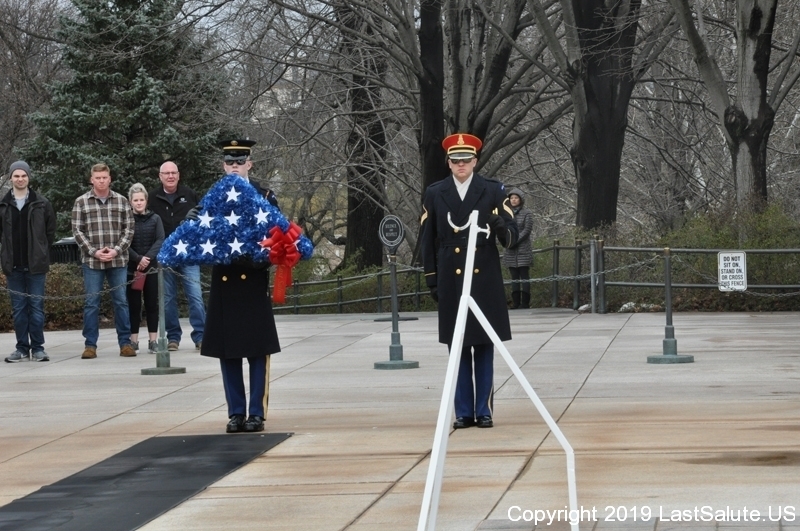 Who among us is willing to defend all this for those he does not even know? 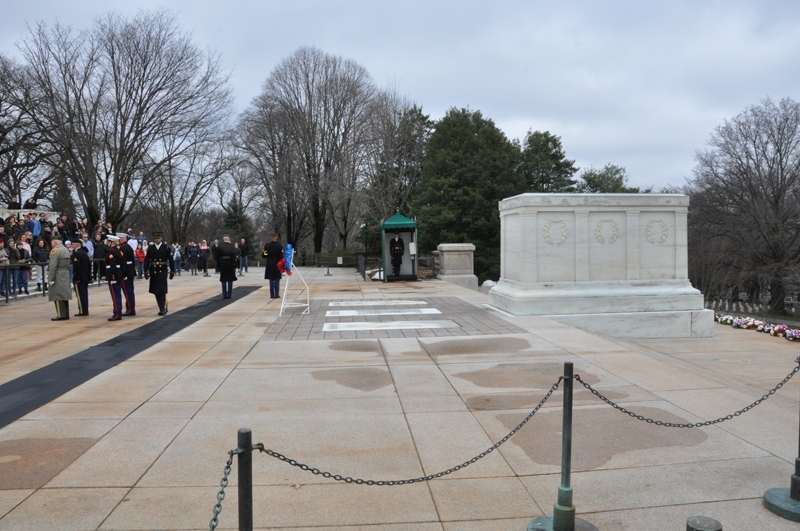 The many great Americans buried at Arlington have. 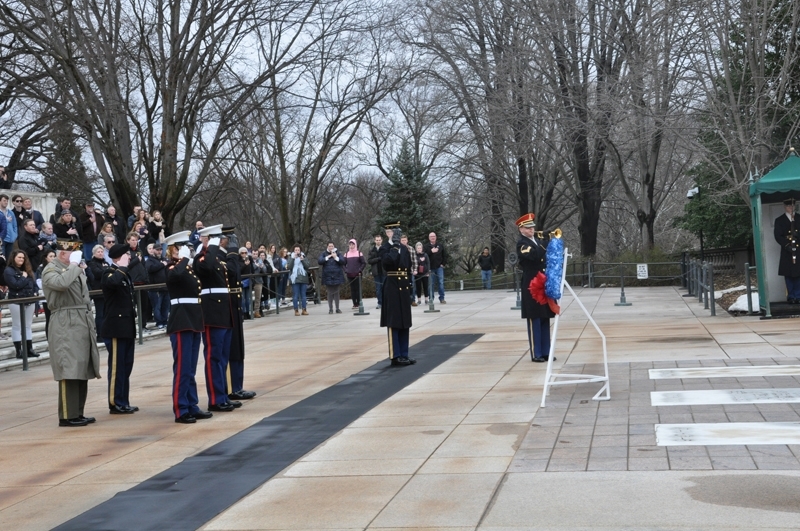 America’s heroes are buried at Arlington and cemeteries around the world. 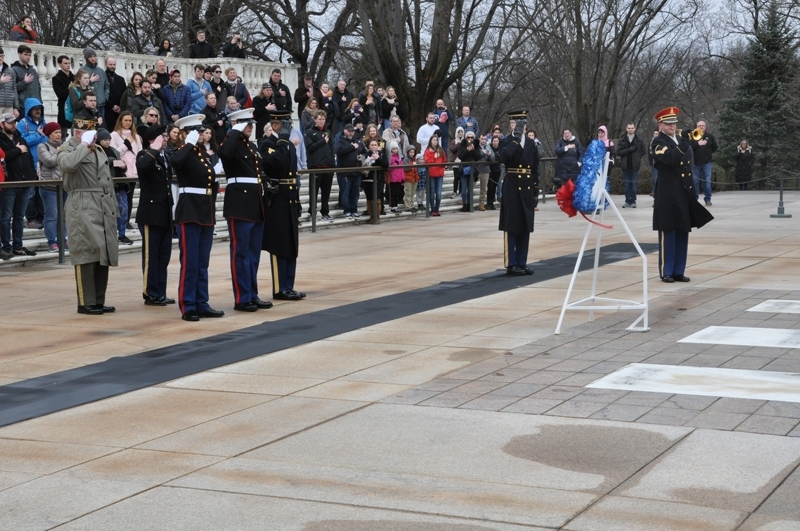 Other countries erect cemeteries and monuments to honor the many Americans who died to protect them. 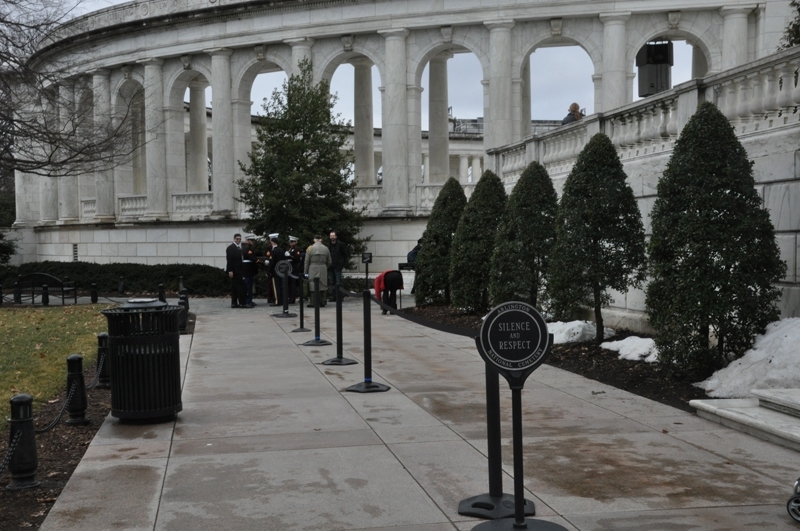 The United States has many Veteran Cemeteries that honor those who served. 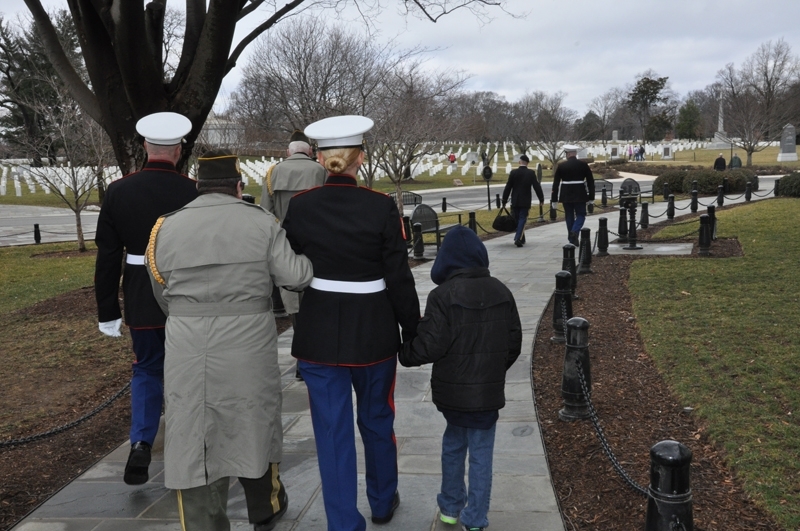 Not all are buried at Veteran’s Cemeteries. 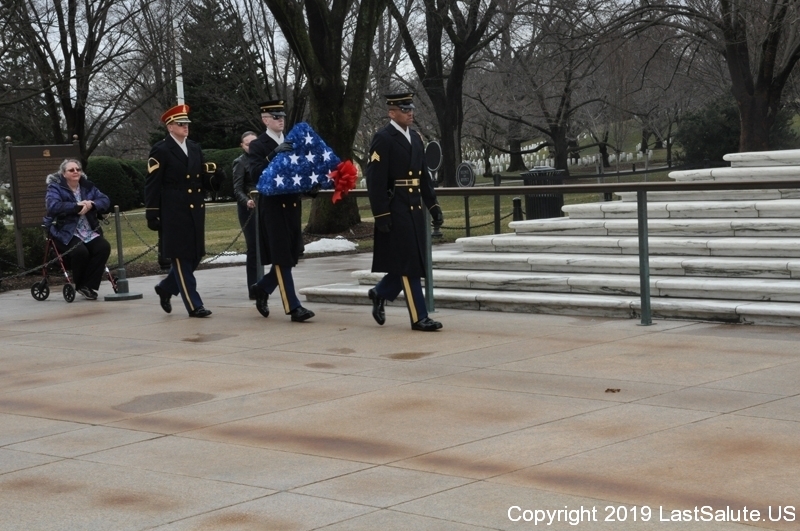 Last Salute conducts military funeral honor ceremonies at any cemetery our fallen heroes wish to be their final resting place. 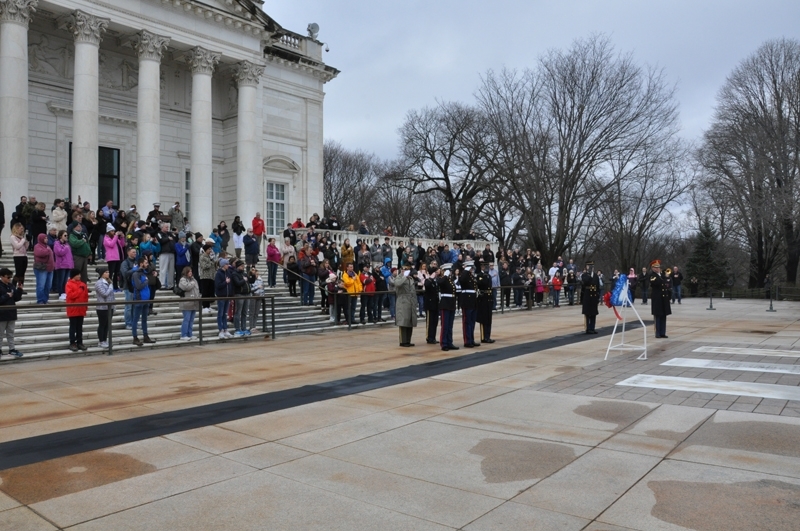 Last Salute has conducted approximately five hundred military funerals in our area. 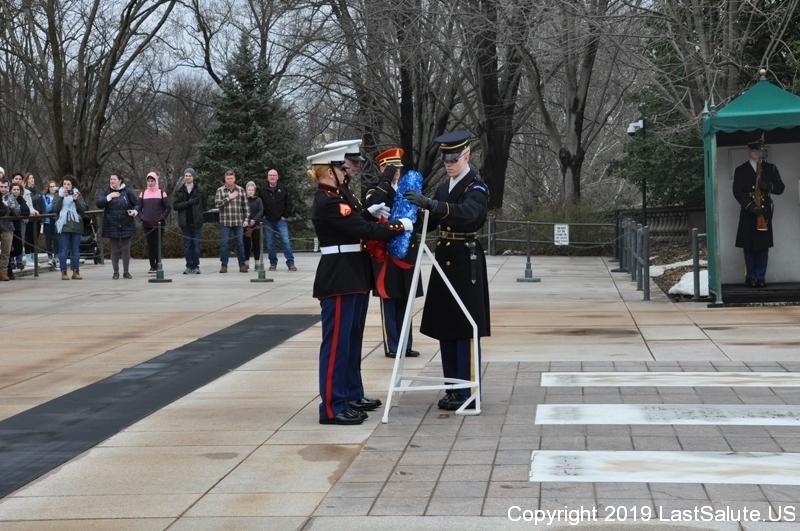 Last Salute has been honored to conduct services for heroes that have stormed the beaches at Normandy on D-Day, attacked the most heavily defended islands in the Pacific including Japan, Fought the Battle of the Bulge, fought in North Africa, France, Germany, Iraq, Afghanistan, Korea, Vietnam and many other far off lands. 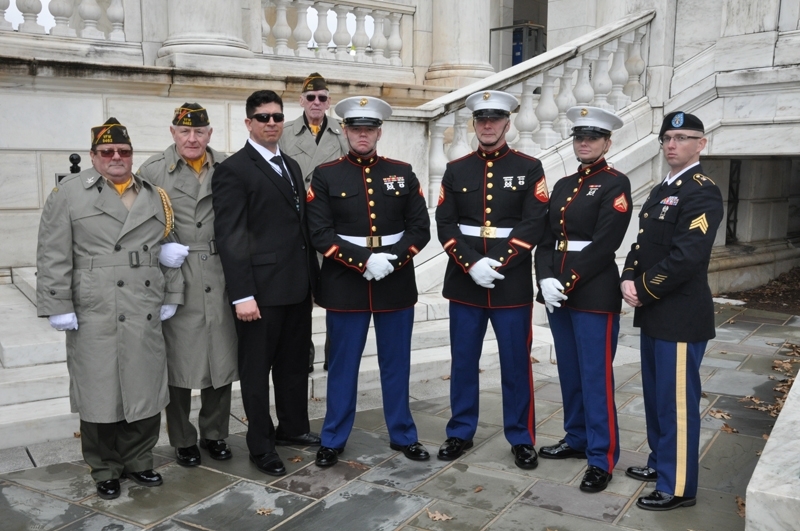 They are Marines, Soldiers, Airmen and Sailors. 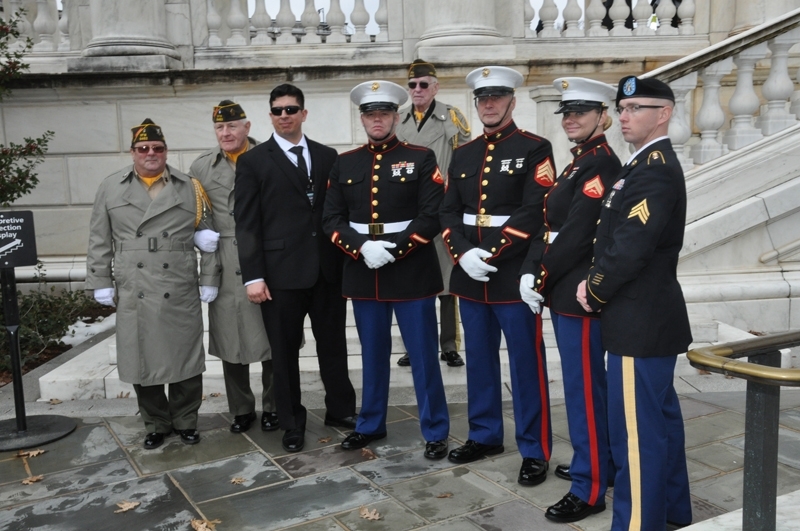 Heroes all, they have a mettle that is unmatched. 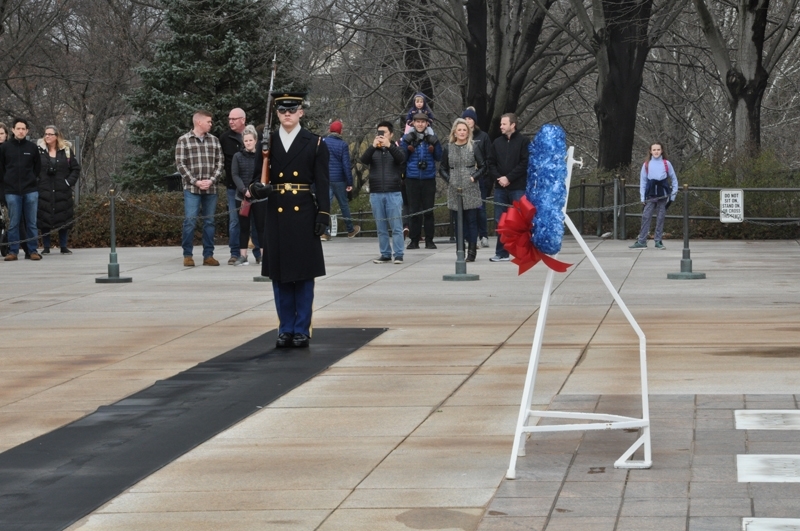 If it were not for them, we would most likely not exist as a nation. 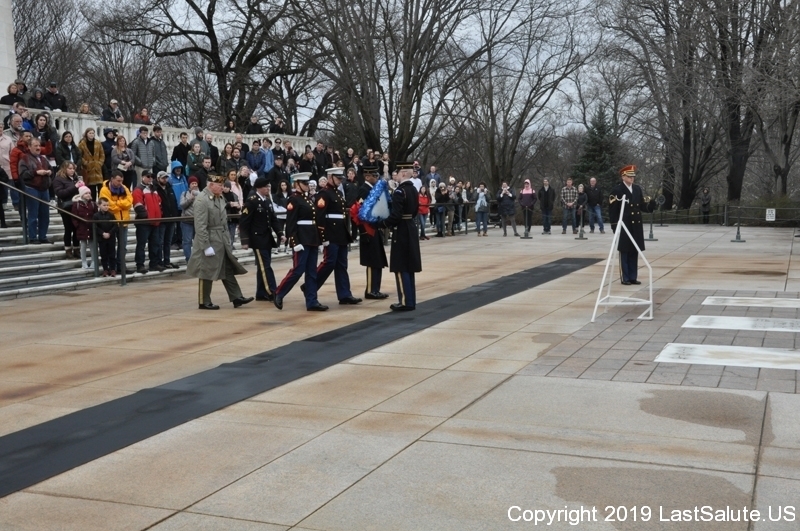 No one who serves in our armed forces should go without burial honors. 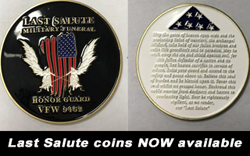 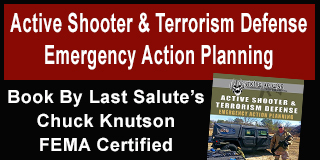 Last Salute is an all-volunteer 501C3 organization founded to provide those honors. 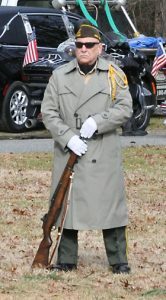 We provide professional, dignified and elaborate military funeral honors including a rifle team, memorial bell, an actual Civil War cannon, flag presentation and the playing of Taps. 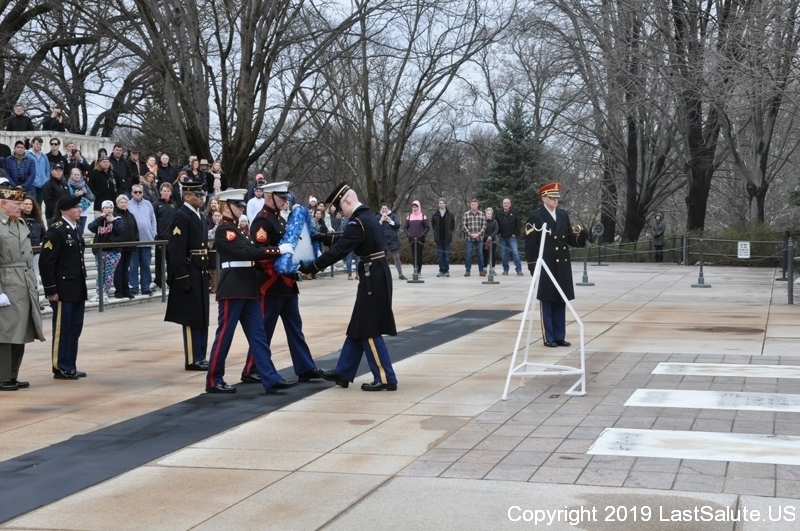 Last Salute even provides “Caisson” service when requested. 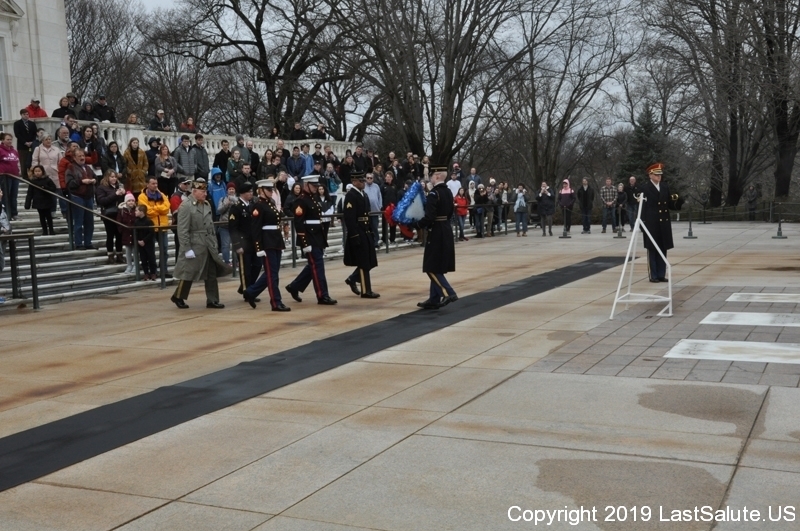 Last Salute conducts ceremonies for veterans and active duty. 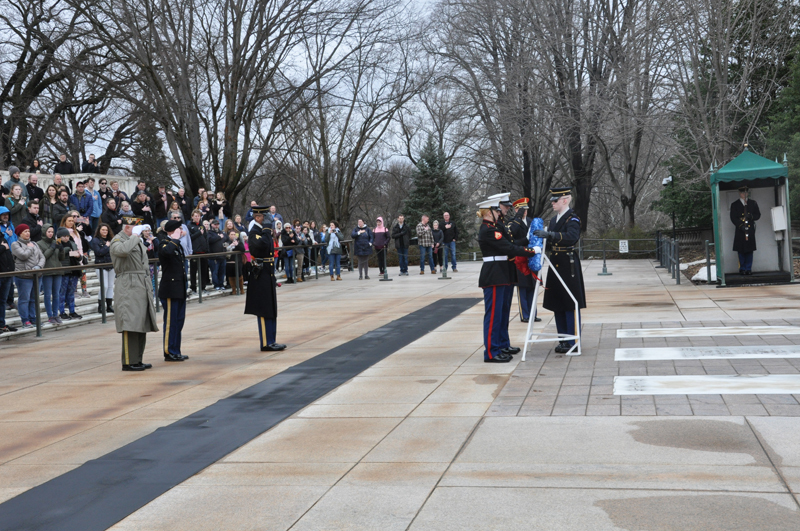 We have even been requested to conduct ceremonies on military installations. 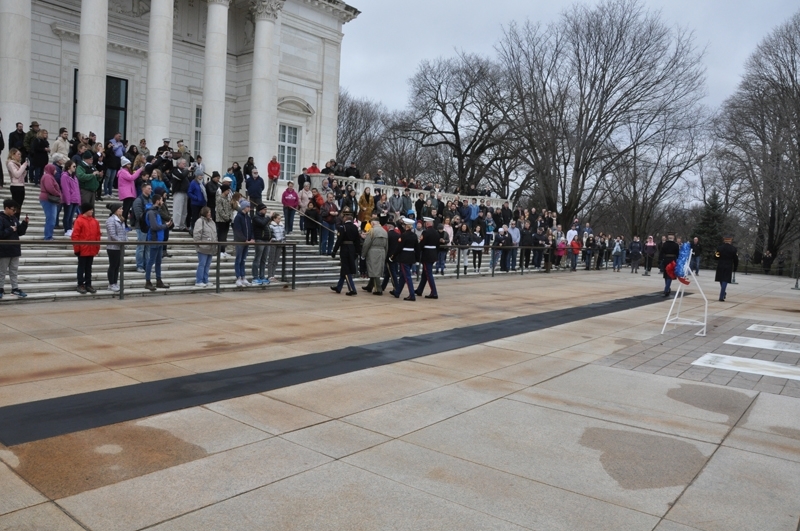 It was an extreme honor to place a wreath at Arlington in front of the Tomb. 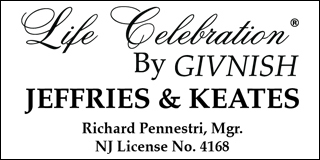 We wish to thank all those who helped and supported us. 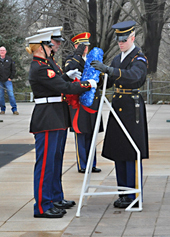 The wreath was made and donated to Last Salute by Pocket full of Posies in Smithville. 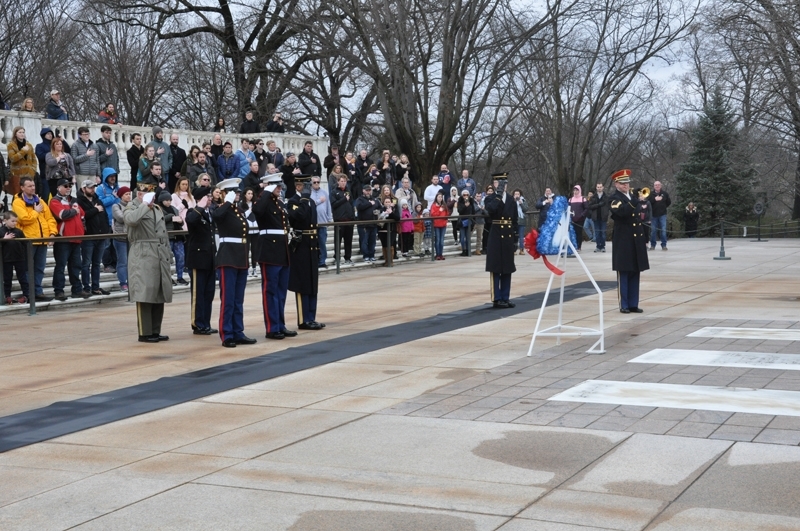 Most of all, we wish to thank the men and women that serve our country.